crunchysoul | Urban living with a crunchy soul. Urban living with a crunchy soul. My nephew lives in NYC about four hours away from us. We see him a couple of times a year, either when my sister comes down to DC or when we both go to my parents’ house for the major holidays. We don’t get up to NYC all that often, as my sister has increasingly pointed out to me (!). 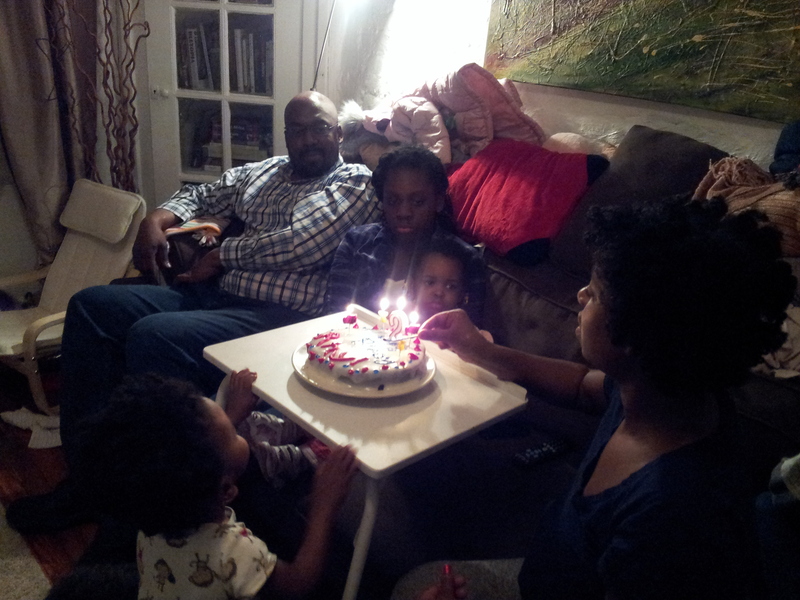 So for his second birthday last month, we loaded everybody up and made the trip to the big Apple to celebrate. I wanted to get him a meaningful gift, something that wouldn’t be unused. I also know my sister has a small apartment — you know how that goes in NYC — and I didn’t want to get anything too big. 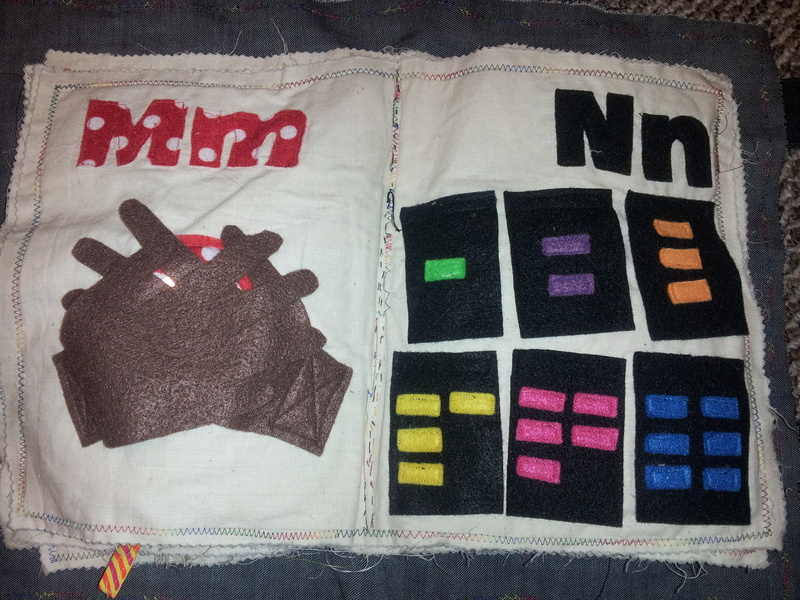 Lastly, I know 2 is that age where they can start getting into games and things, so I wanted to make something educational that he could work on semi-independently. 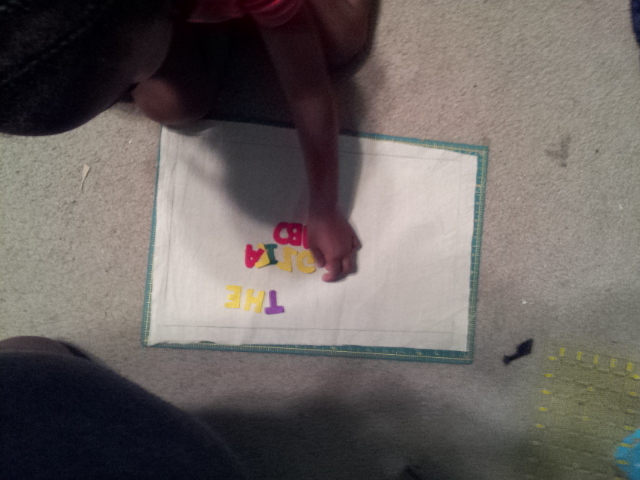 I decided to make him a matching game. I just got my nifty laminating machine for another craft project a few months ago, and I needed an excuse to use it again. I had seen similar ideas floating around on mommy blogs and wanted to try it. Even better, I decided to use photos of our family members as the images that he would match, so it would be game custom-made for him. I figured he could get used to associating people’s names with their pictures, and then maybe we would all be more familiar to him. 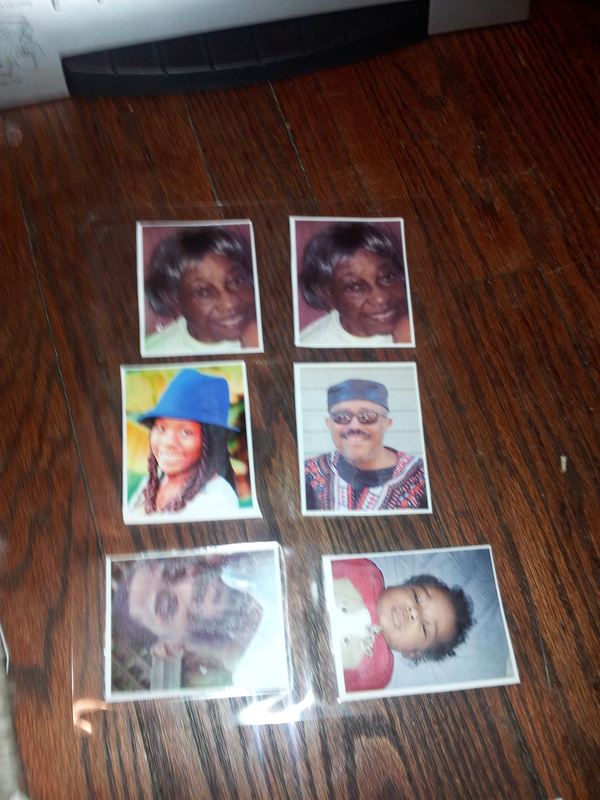 I added in my parents, my aunts, and my grandmother in addition to my kids. And I did his mommy and dad. And of course, the birthday boy had to have his own photo. First off, you need to get some good photos to work with. 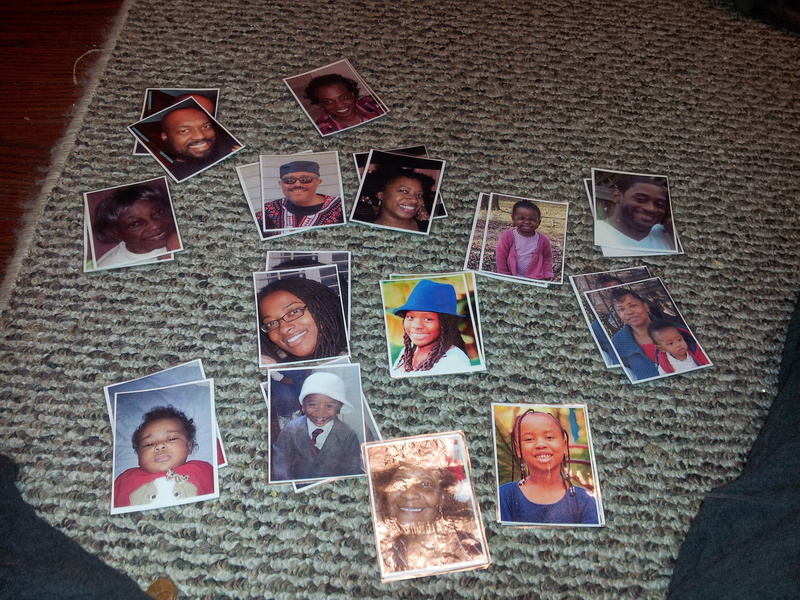 If I had to do it all over again, I would have made a point to get a clear headshot photo of all the family members I wanted to include in the matching game. I could have done this when I was home for Christmas if I had thought a little further ahead. As it was, I had to dig around for pictures, and then had to crop them to show the face clearly. This made the quality of pictures vary because of the different cropping I had to do. After cropping all photos to show the face and shoulders, I used the Microsoft Picture Manager program and printed two copies each on the wallet size setting. 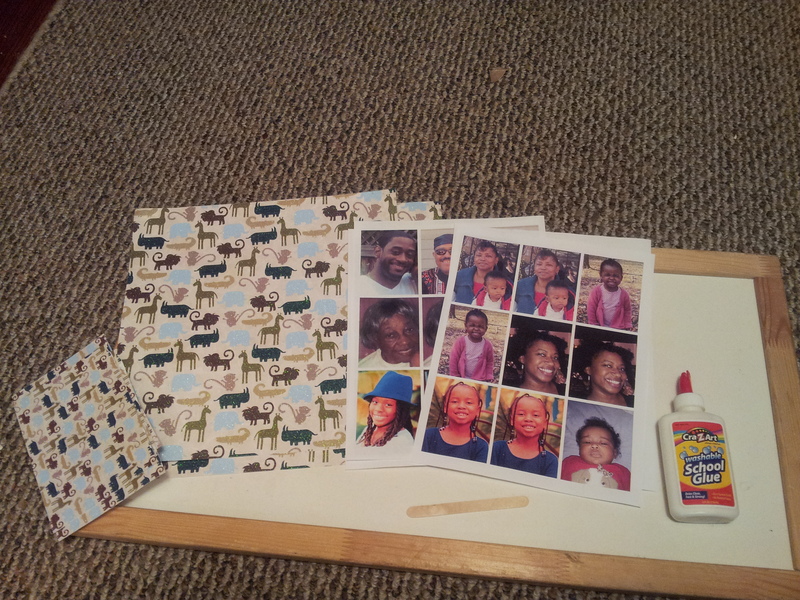 Then I glued the pictures onto the scrapbook paper. It probably goes without saying that you want to glue these back to back, so that once glued, your photos show on one side and the print of the paper shows on the other side. 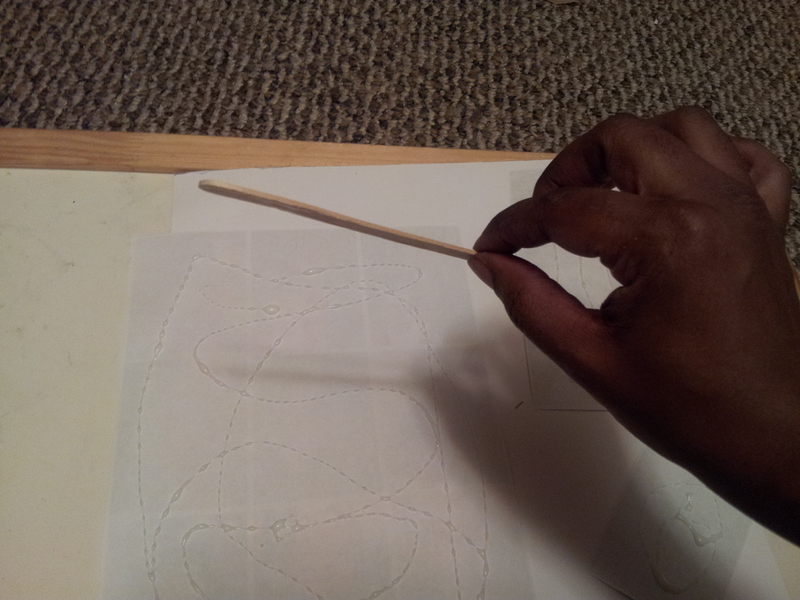 I used the Popsicle stick to spread the glue evenly. You could have used the glue stick instead of the Popsicle stick with white glue. Since the computer paper was not the same size as the scrapbook paper (and I had a limited amount of scrapbook paper), I had to cut out some of the photos and arrange them so they would fit on the scrapbook paper. I guess you could say I had to “get them in where I could fit them in.” :-) The picture above is of me planning the placement of the photos. I ended up putting some single photos onto the right side of the scrapbook paper. 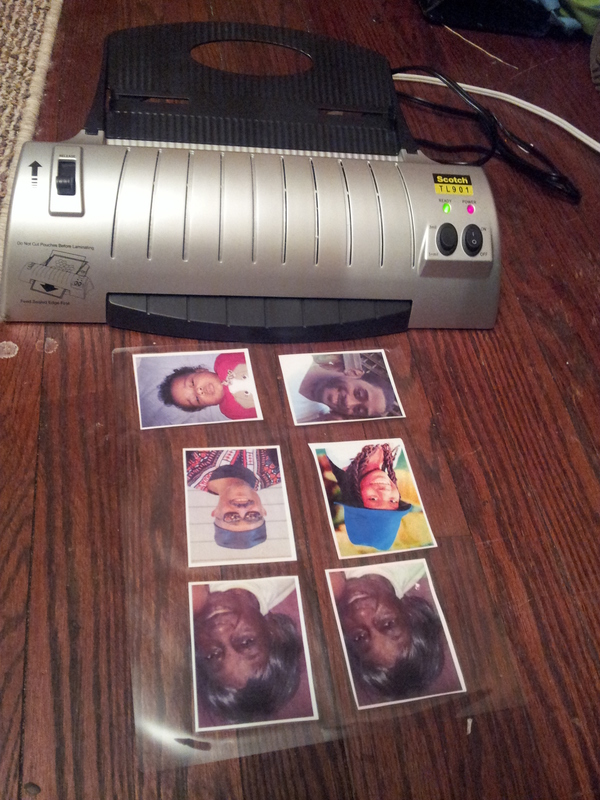 Once the photos were glued onto the scrapbook paper, I cut them out and fed them through the laminating machine. 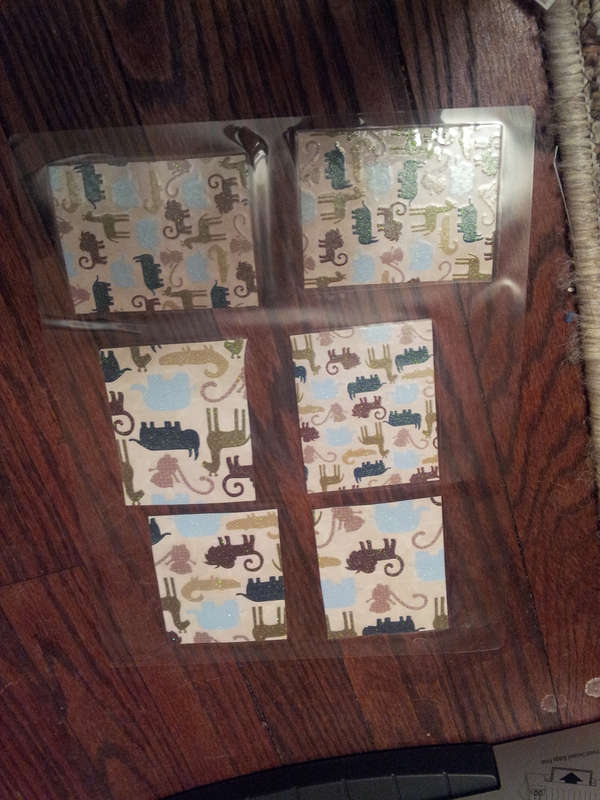 Then I simply cut each card out and paired them up. 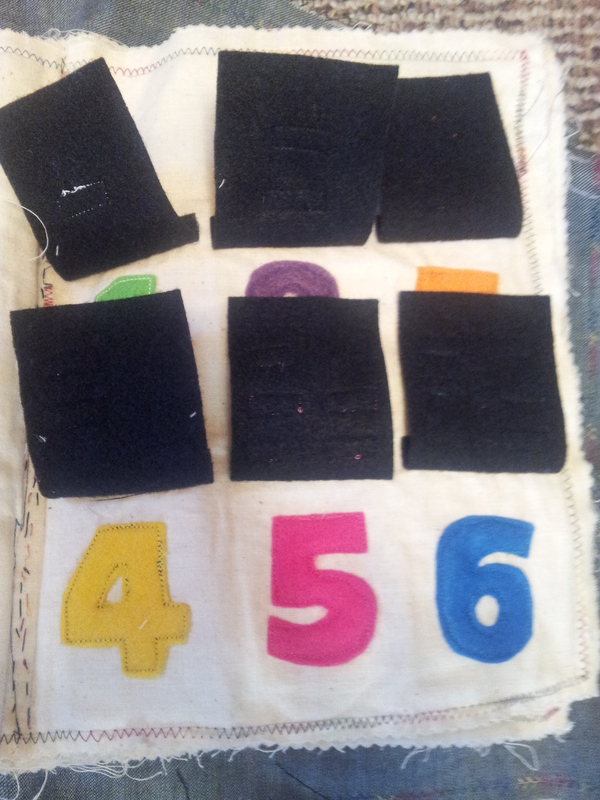 I wish I could have sewn some sort of drawstring bag to store the matching game, but I ran out of time before our trip. 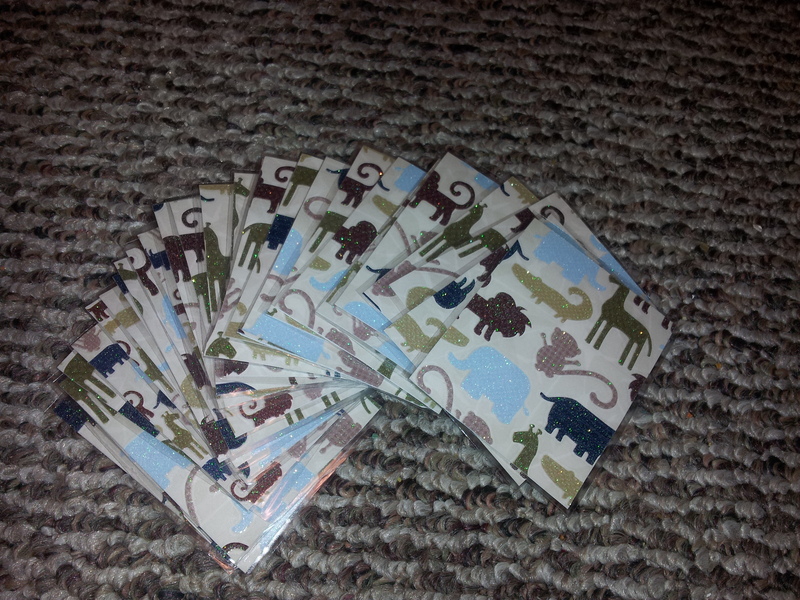 I ended up storing them in a Starbucks tea container, which is a cute little metal box that he can carry with him. Even with that I wanted to modge podge the tea container but didn’t have time for that either. Needless to say the gift looked a bit homey in its undecorated Starbucks container, but I hope he likes it nonetheless! 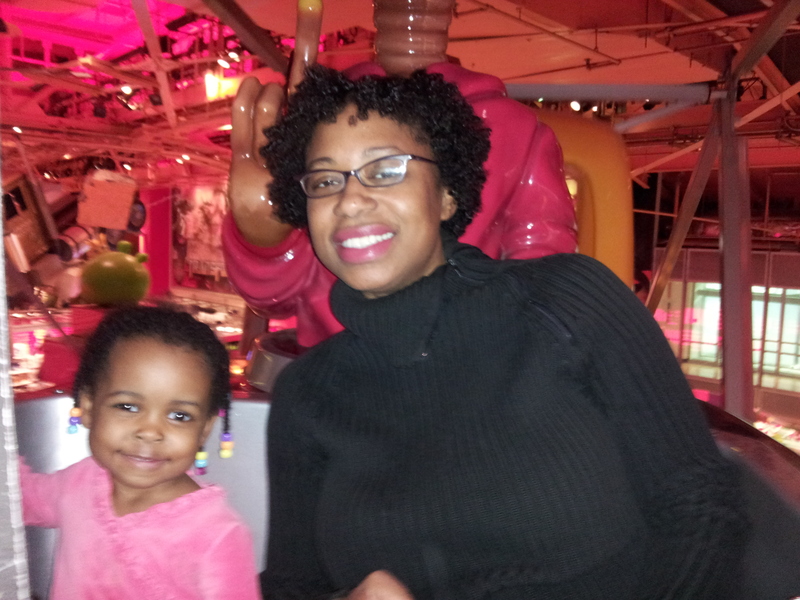 Here are some parting action shots of our NYC Adventures. 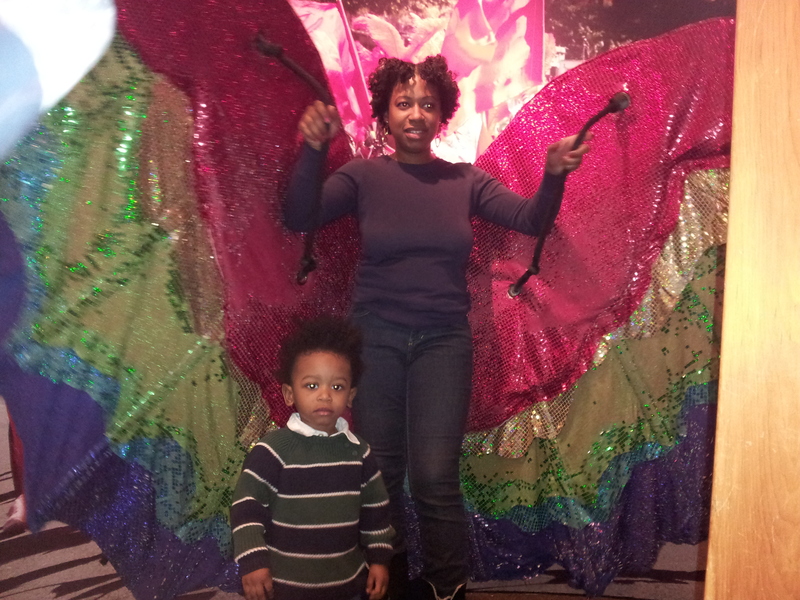 My sister and my nephew t the Caribbean room at the Brooklyn Children’s Museum. 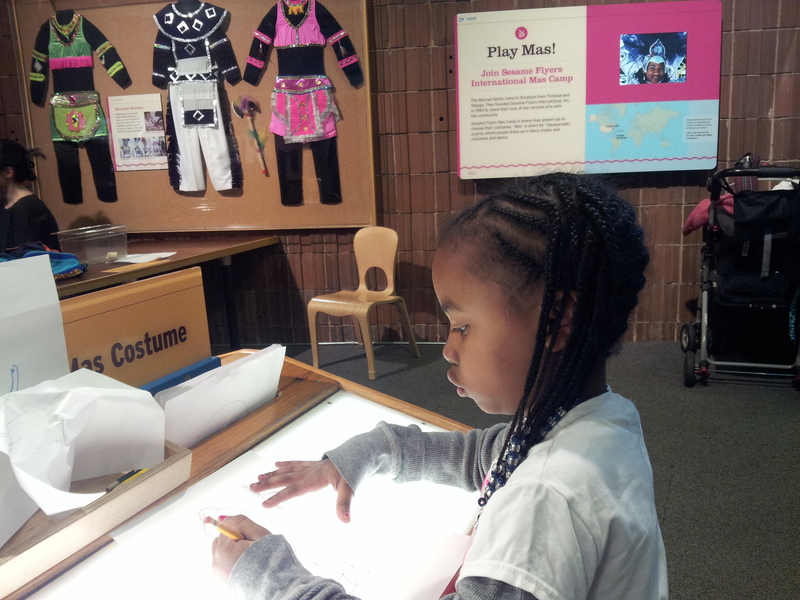 Snaggle concentrating on a costume at the Brooklyn Museum. 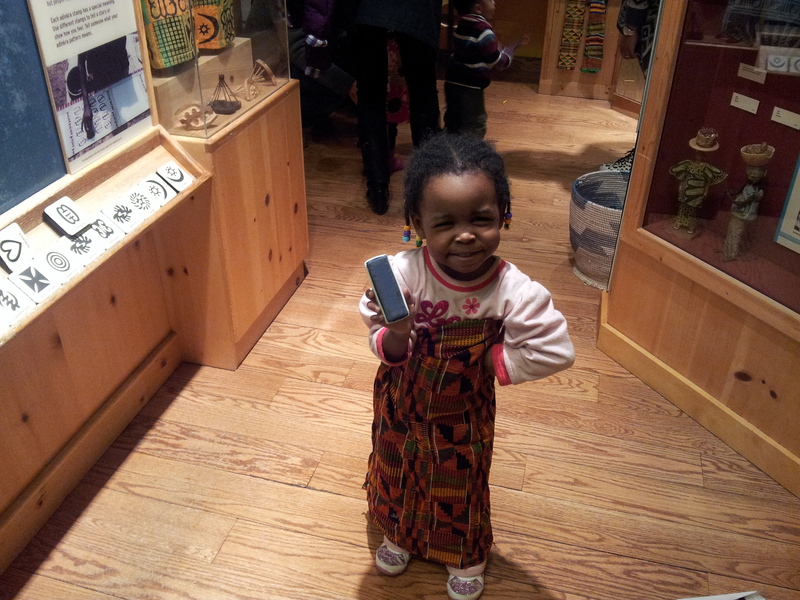 Mamacita in the African shop at the Brooklyn Museum. 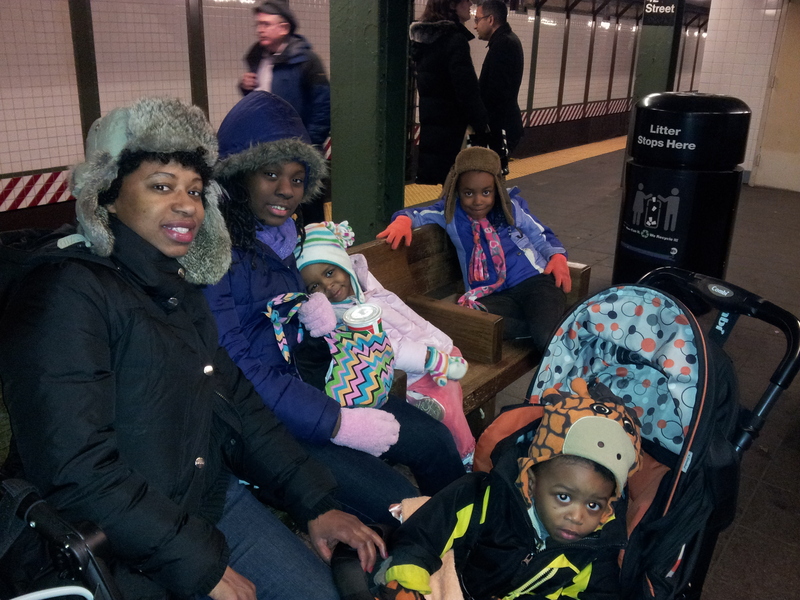 Here’s the gang on the subway to Times Square. 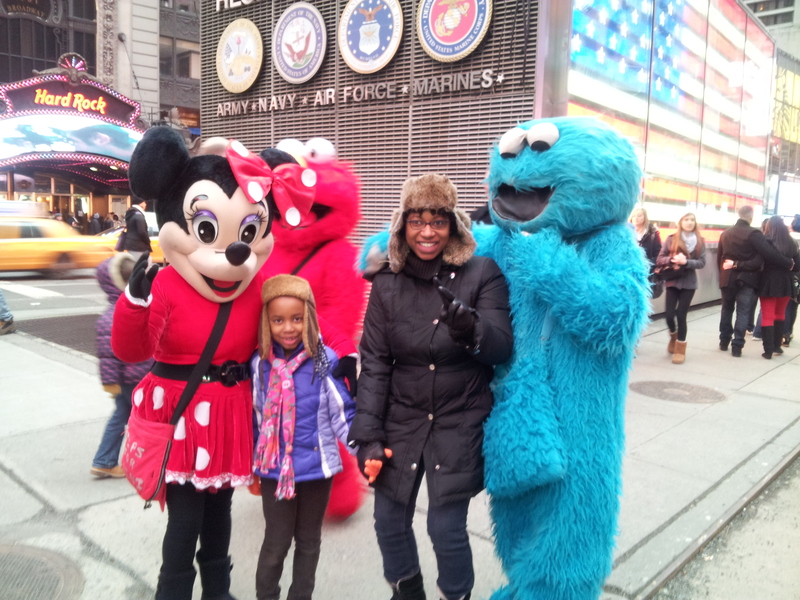 Snaggle, my sister, Minnie Mouse and Cookie Monster in Times Square. 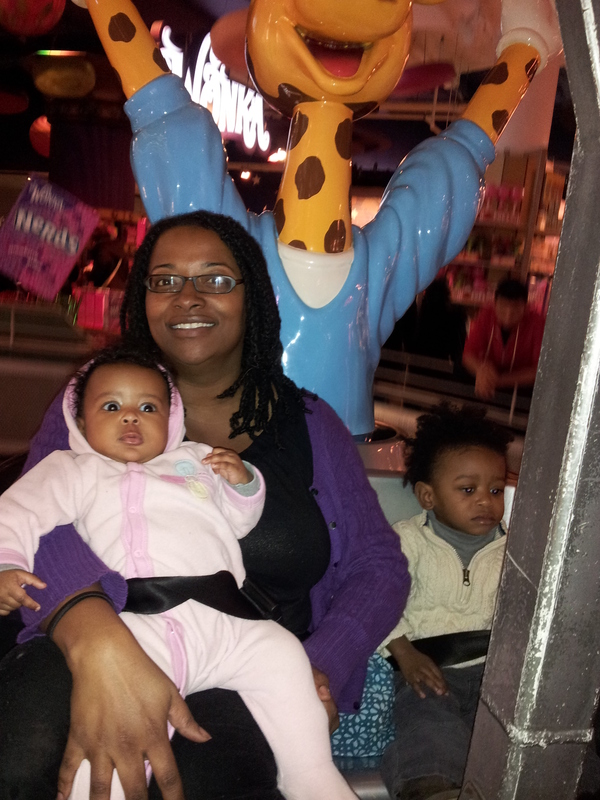 My sister and Mamacita on the Ferris Wheel at Toys R Us in Time Square. This entry was posted in handmade game, paper crafts and tagged personalized matching game on March 25, 2013 by crunchysoul. In my previous post, I told you the whole sordid story about how my Quiet Book came to be. I showed each page spread there, but didn’t go into detail about the individual pages. So here is the page-by-page breakdown, with a description of activities for the kiddos on each page, my favorite pages, and the places where my vision didn’t quite come together on the page (to put it nicely). Luckily felt is very forgiving. I hope people get ideas from this, or at least pick up some tips about what worked well for me and what not to do. Again, some of my pages were adapted from the blogosphere. Most are from the book 26 Lively Letters. A few others are from the A-B-C 1-2-3 Craft Book. Both are older books that you might be able to find used as they are likely out of print. 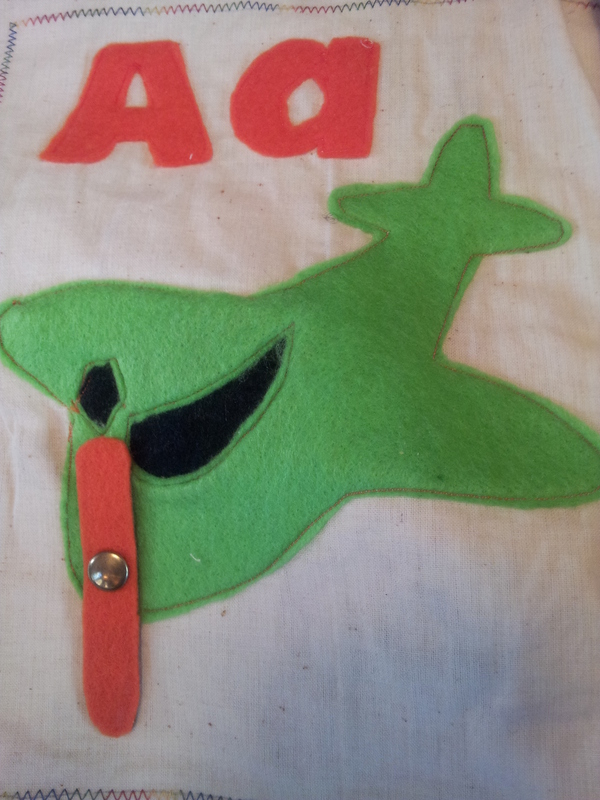 A is for Airplane — the propeller on the plane flips around. 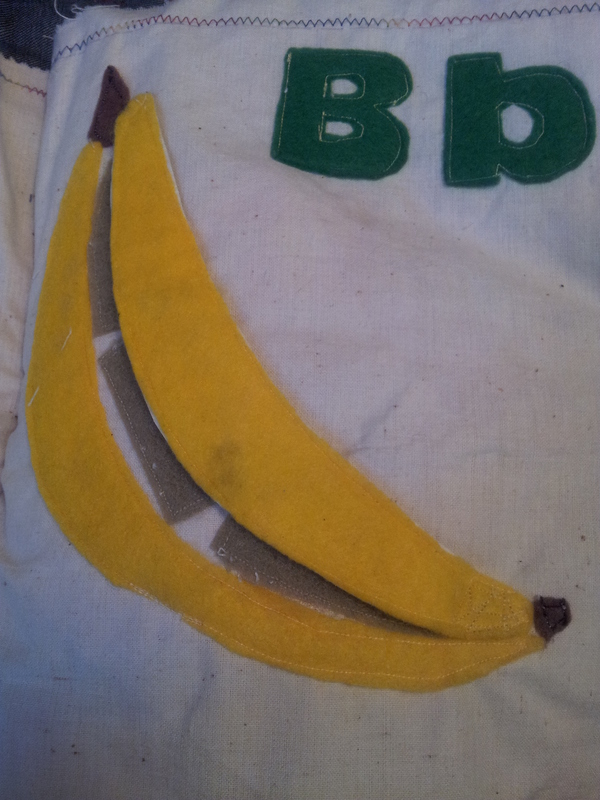 B is for Banana — the banana is attached with velcro and can be peeled and replaced. 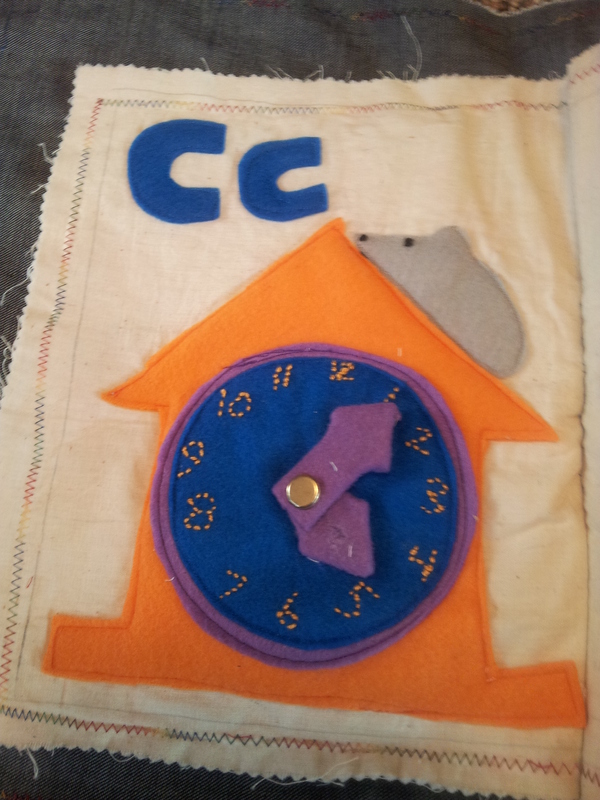 C is for Clock — the hands spin around. (such a classic page for Quiet Books, but I did get the idea for the mouse from another blogger, whose page I can no longer find now). I was proud of how this turned out, even with the unique colors. 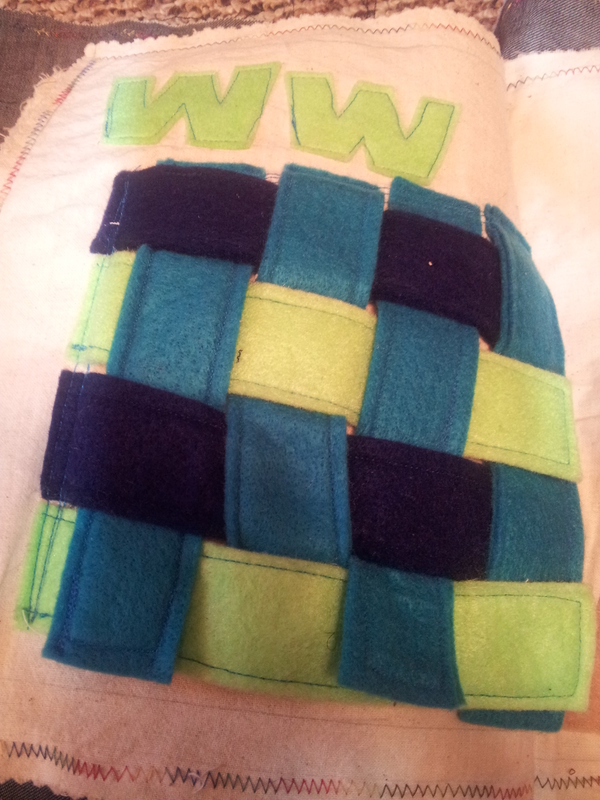 I also learned how to do some rudimentary embroidery on this page too. 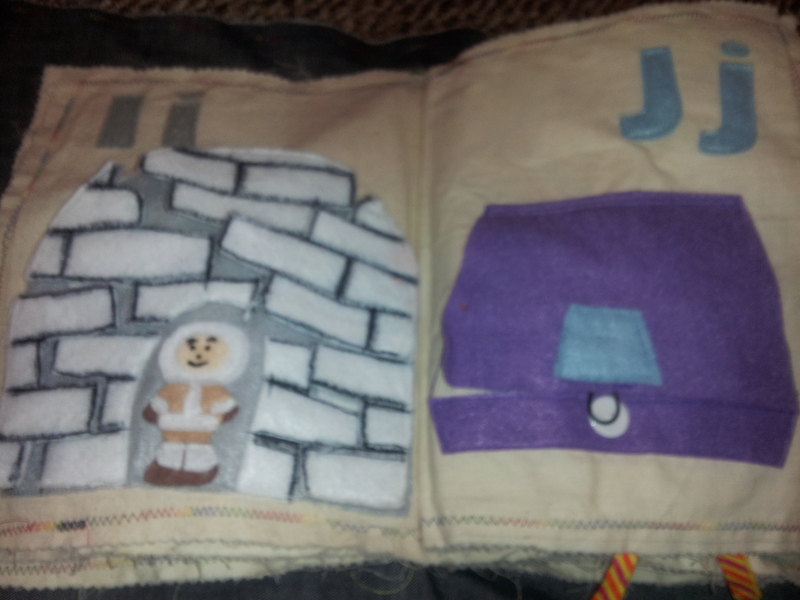 That was another benefit of the Quiet Book, the chance to learn some new crafting skills. 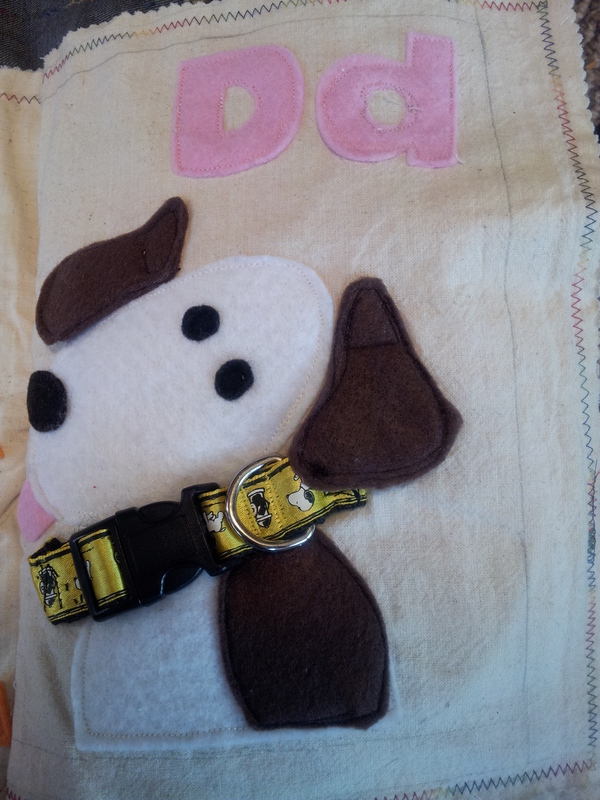 D is for Dog — the collar can be snapped on and off. It’s a real dog collar. 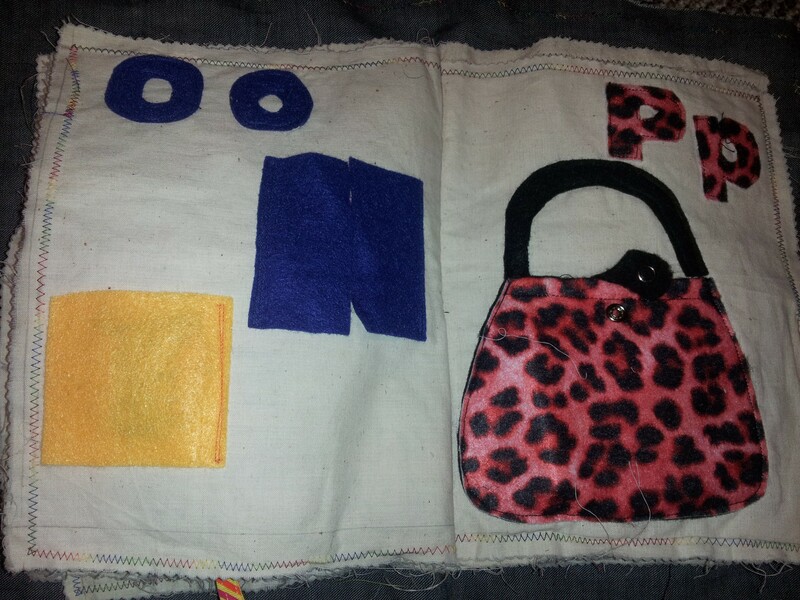 I bought an inexpensive one and just cut it to the size I needed and sewed it onto the page. 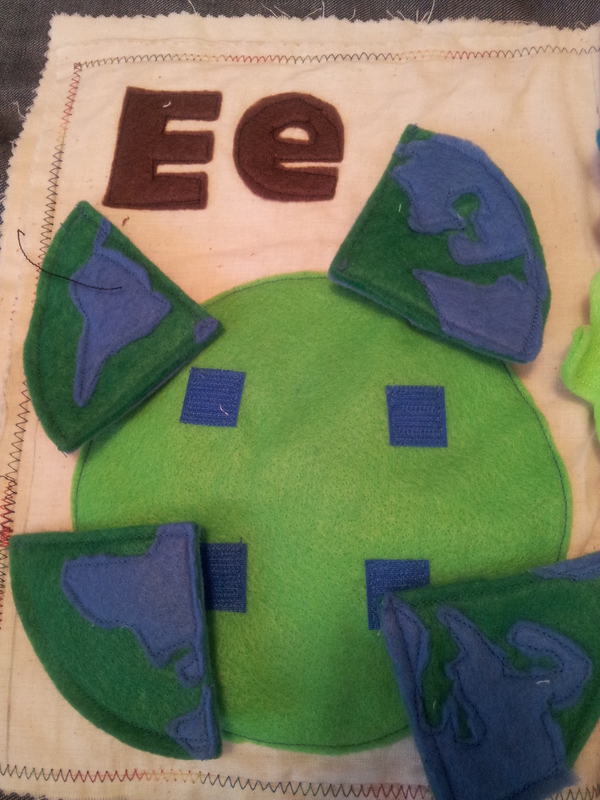 E is for Earth — The Earth is a four piece puzzle that you can assemble with velcro. This is one of my unique page ideas. 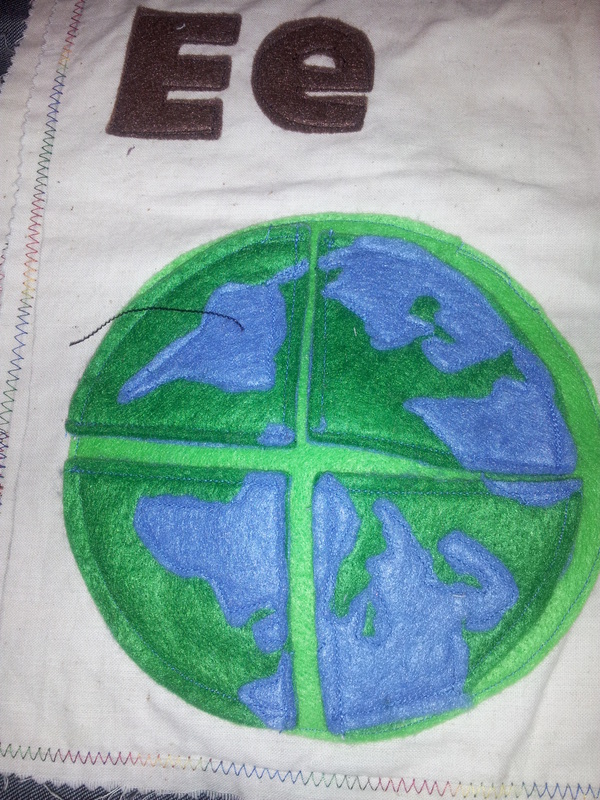 I used free clip art for the Earth shape, which like most of the pictures I made, I traced onto regular printer paper, pinned it to felt, and then cut it out. I must have been quite tired when planning this page, because I made the water green and the continents blue. Go figure. I should have put a red star to identify the state we live in — maybe will add that later. Please note: the puzzle is not assembled correctly in this photo. 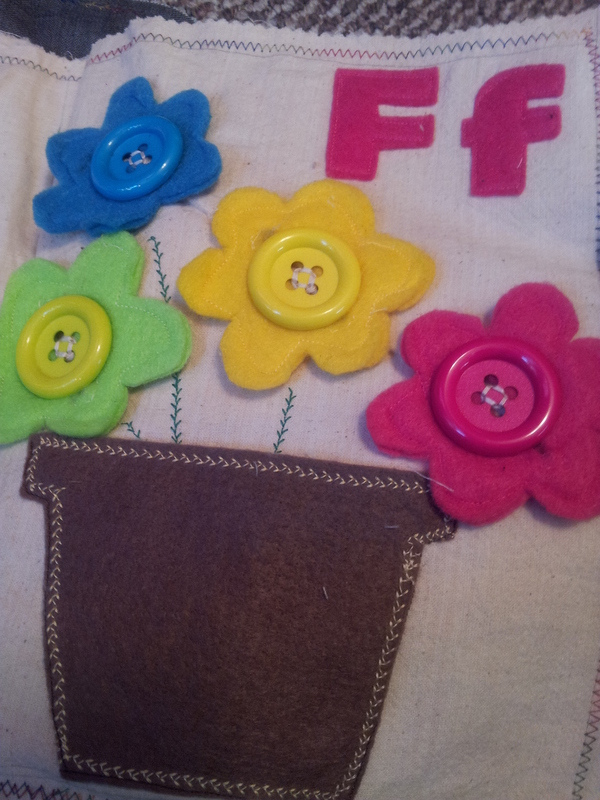 F is for Flowers — the flower petals button on and off and can be stored in the flower pot. 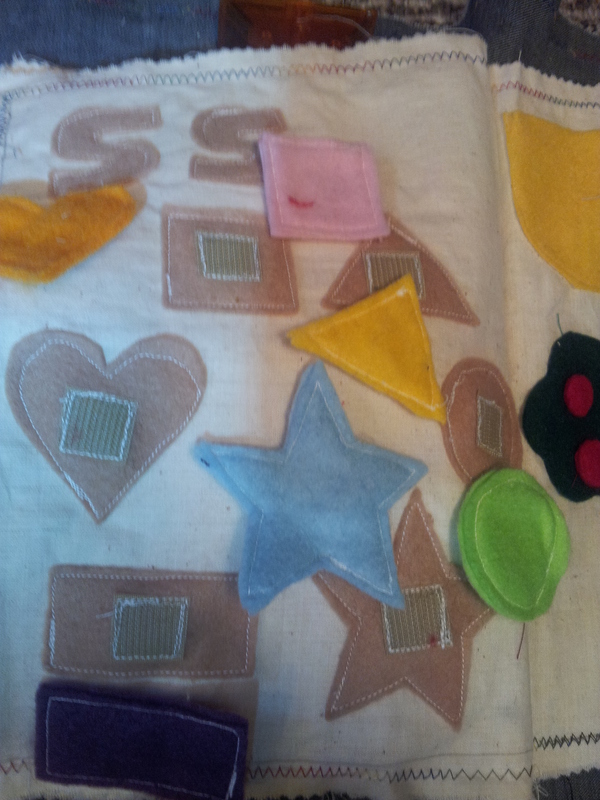 This type of buttoning practice is apparently good for developing fine motor skills and practical life skills too. 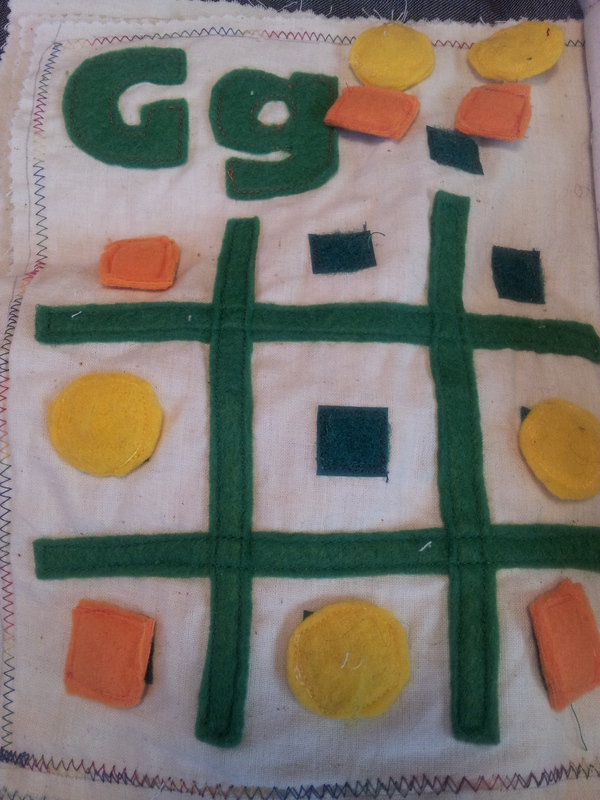 G is for Game — you can play an adapted version of tic tac toe with the yellow circles and orange squares. 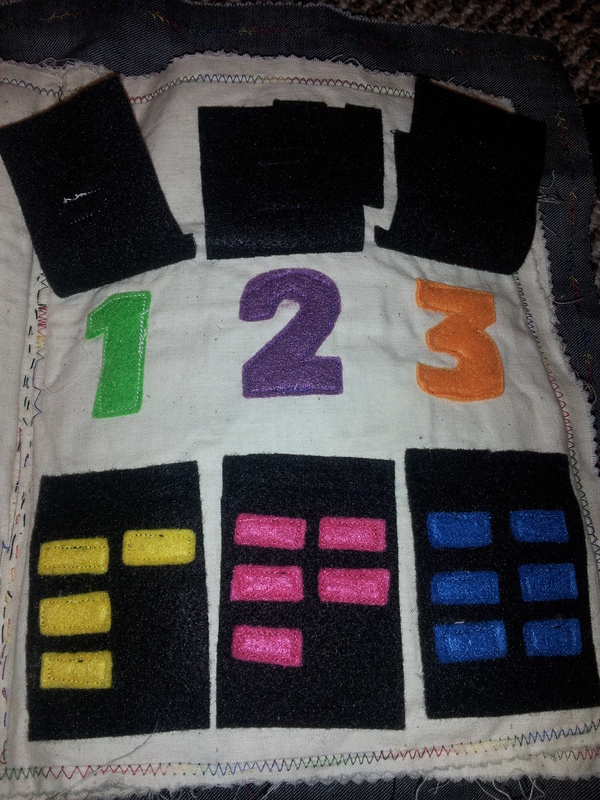 The game pieces attach with velcro. 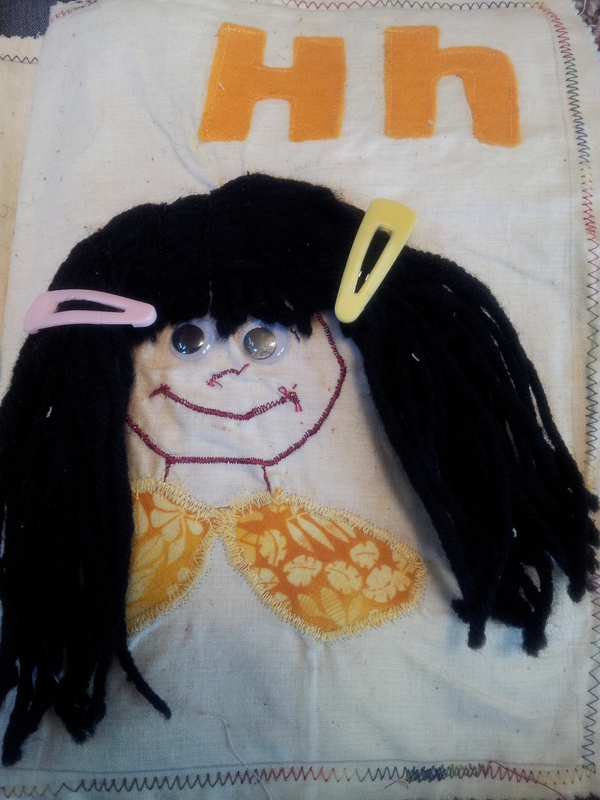 H is for Hair — you can style the little girl’s hair, which is made of yarn. 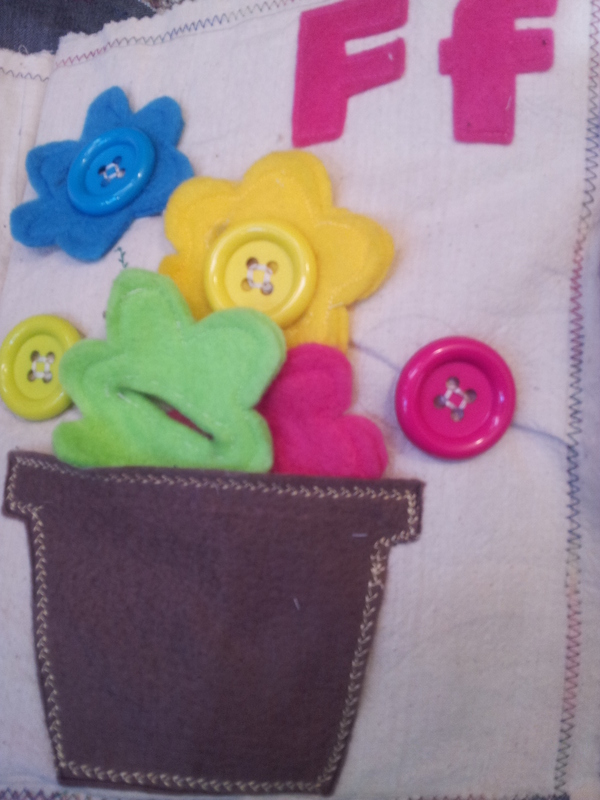 I wish I had added a little felt basket or something to hold barrettes and hair clips for this page. This was actually one of the first pages I made. I still have about 48 leftover googly eyes. I see how you quickly develop craft clutter. Gotta find something to make with those remaining eyes. 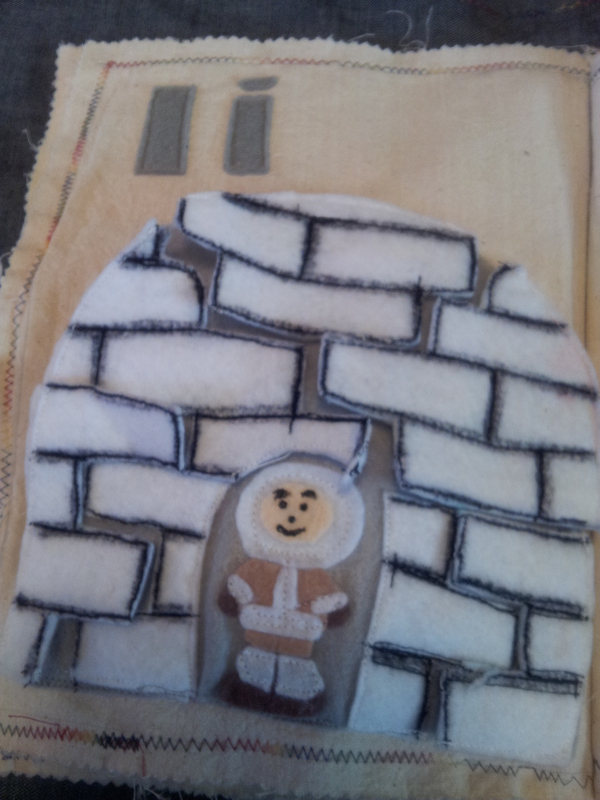 I is for Igloo and Inuit — You have to rebuild the igloo by attaching the felt brick pieces to the background via velcro. I found inspiration for this page along with other amazing pages here, but decided to include an Inuit in the doorway (not an Eskimo, folks, though apparently there is still some debate about the appropriate name). I’ve noticed how many stories about Africa feature animals as main characters and act like the people there are invisible. I didn’t want to do the same thing here, so I added a person instead of a penguin. I’m so proud of that shearling coat, I can’t even tell you. Also, the original page was in a different language — Polish, I think — so I had to figure out how to do it on my own. My backup option was Ice Cream with different colored cones if the Igloo didn’t work out. 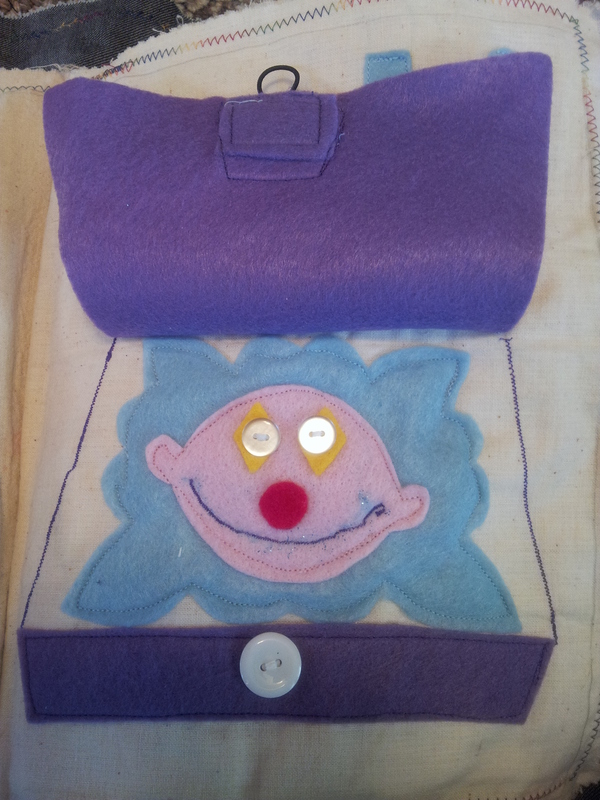 J is for Jack in the Box — you can button the string to close the box. This one is straight out of 26 Lively Letters. I was worried the clown would come out looking too creepy, but he’s actually okay. Like on a 5 on the creepy scale of 1-10. I don’t have a big fear of clowns, but did grow up during the Poltergeist movie era, and the whole connection of creepy = clown stayed with me a little. 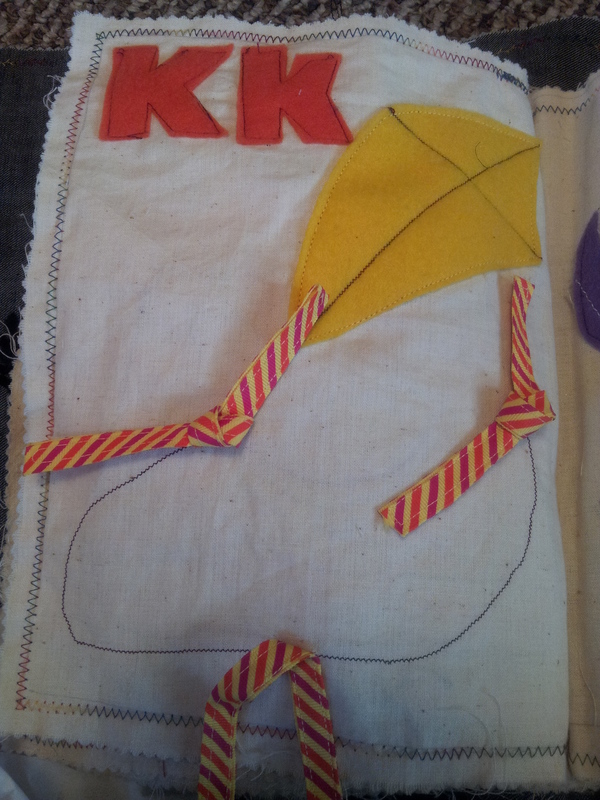 K is for Kite — the kids can learn to tie a knot with the tails of the string. This one is also straight out of 26 Lively Letters. 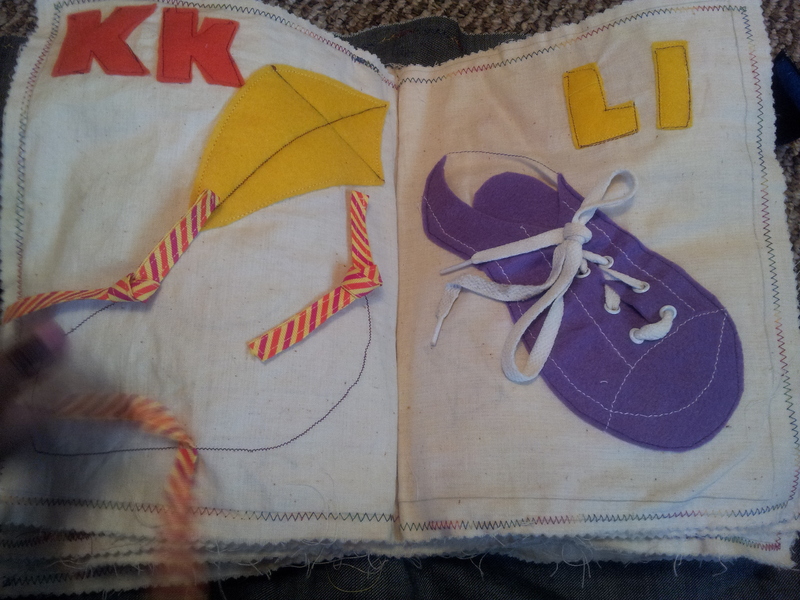 L is for Laces — another classic quiet book page here. You can lace the shoe up and tie the laces. 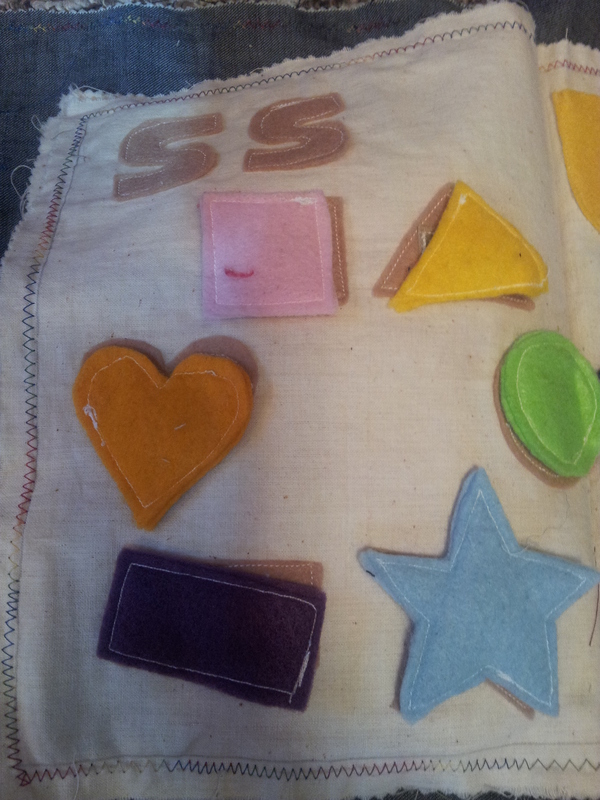 I know this one is a stretch to be used for L instead of S, but I wanted to keep S for shapes. 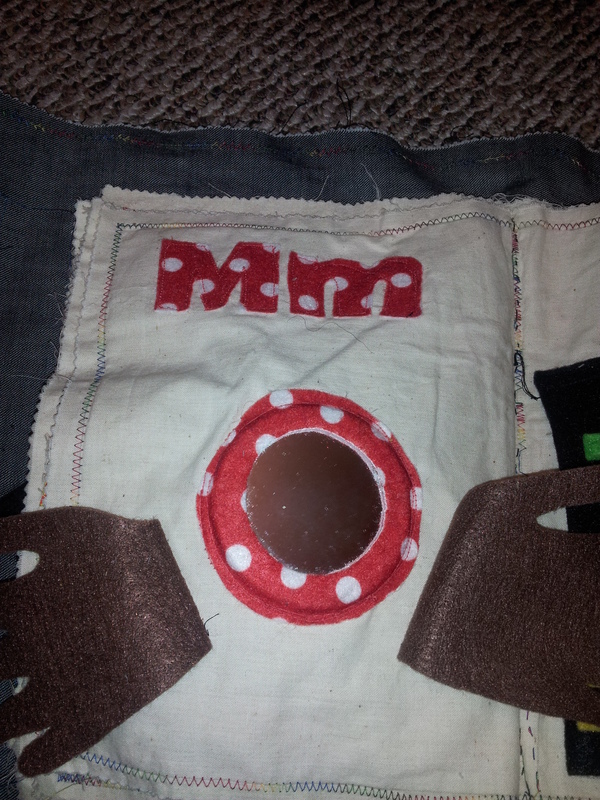 I learned how to insert eyelets with this page. 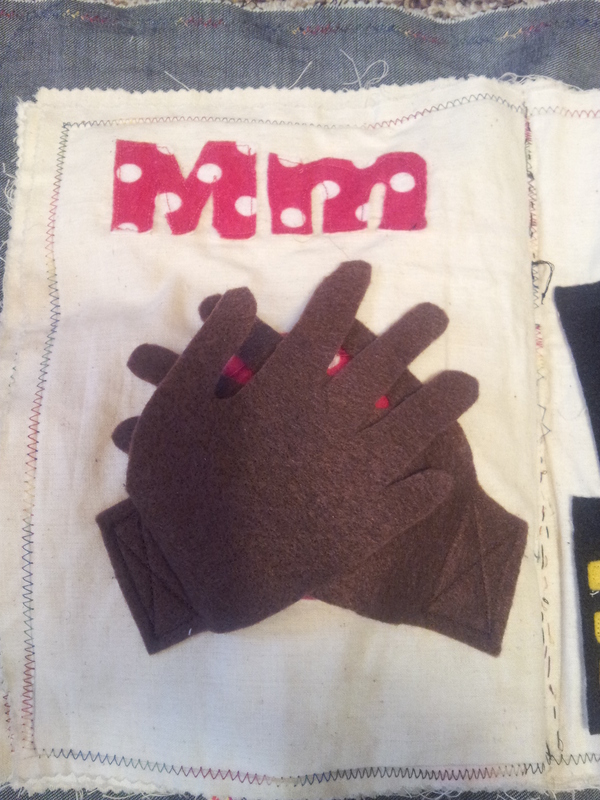 M is for “Me” in the Mirror — the hands can be moved to reveal the mirror, sort of like a game of peekaboo. Combined with solitaire. A little strange, but it still works, I think. 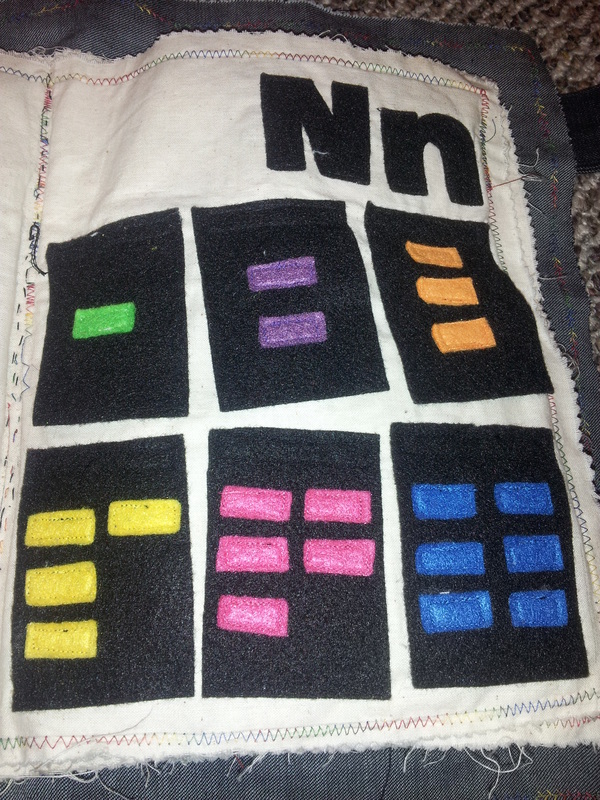 N is for Numbers — each flap lifts to reveal the corresponding number underneath. 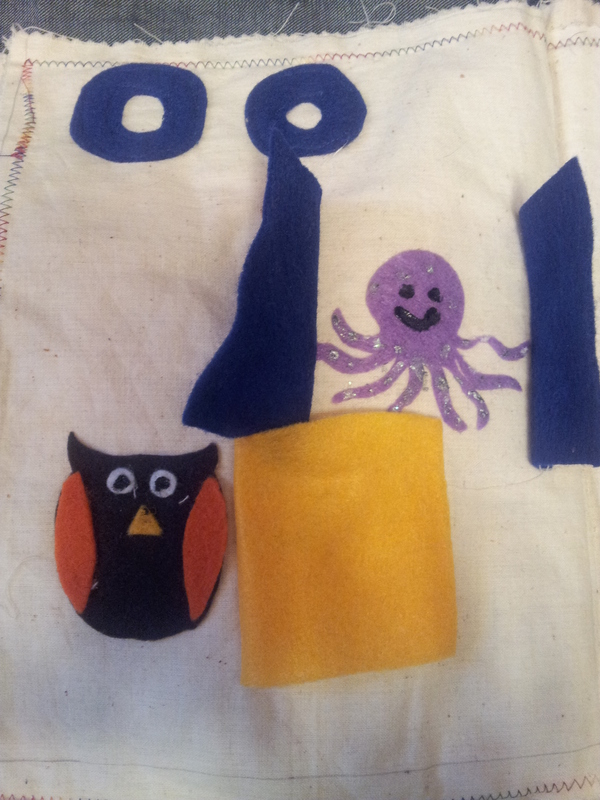 O is for Open, Octopus, and Owl — you can open the “window” or the “door” to reveal the animal underneath. 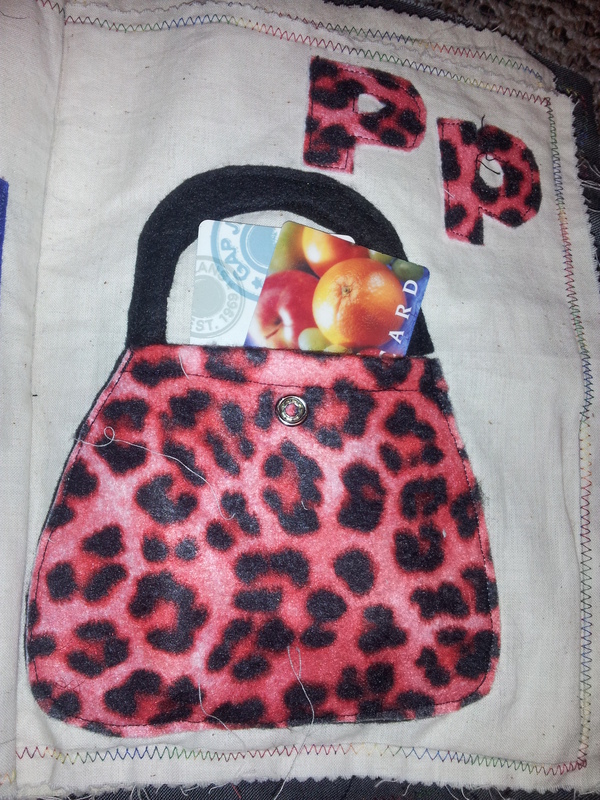 P is for Purse — you can snap the purse open and actually store things in there too. 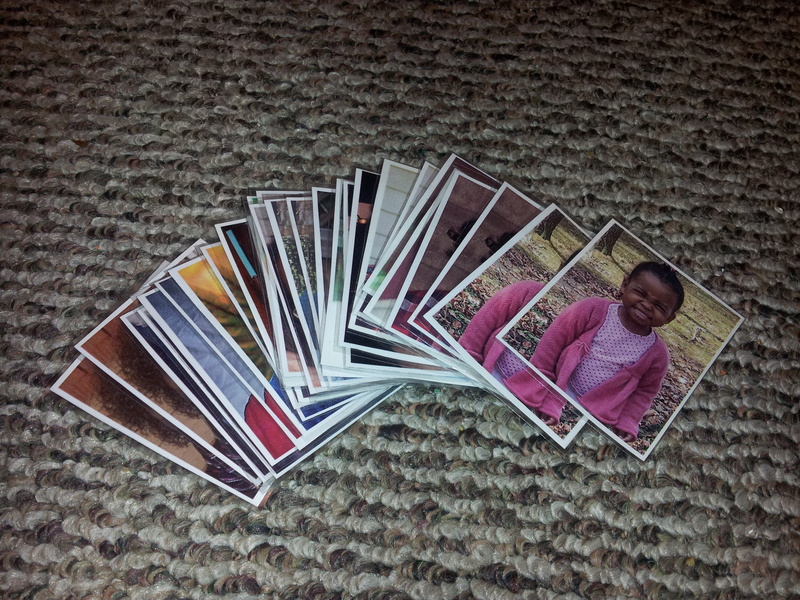 I put some old credit cards and store discount cards for the girls to play with. This page is also popular with them. 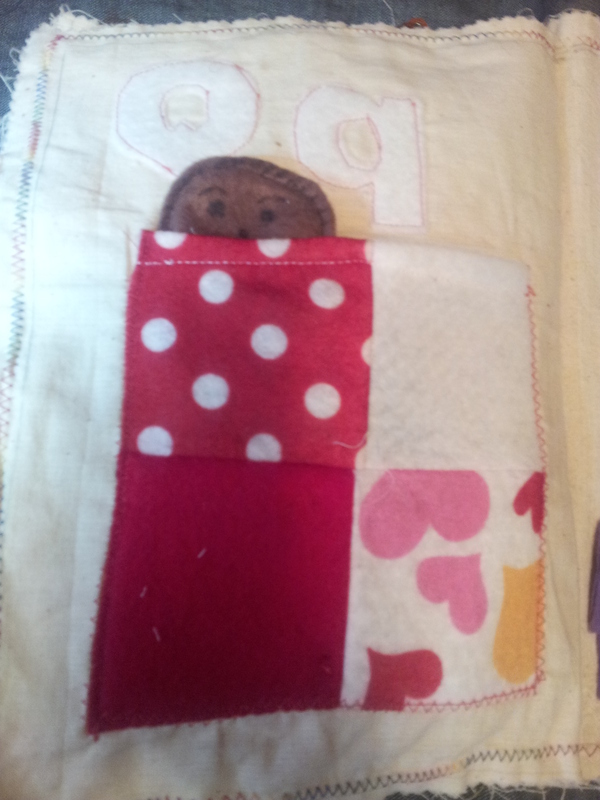 Q is for Quilt — the little girl can be tucked into bed under her patchwork quilt. Yes, the scandalous little girl sleeps in her birthday suit. This was one of my last pages, and I didn’t have the wherewithall to sew on another layer of felt to get her some pajamas! 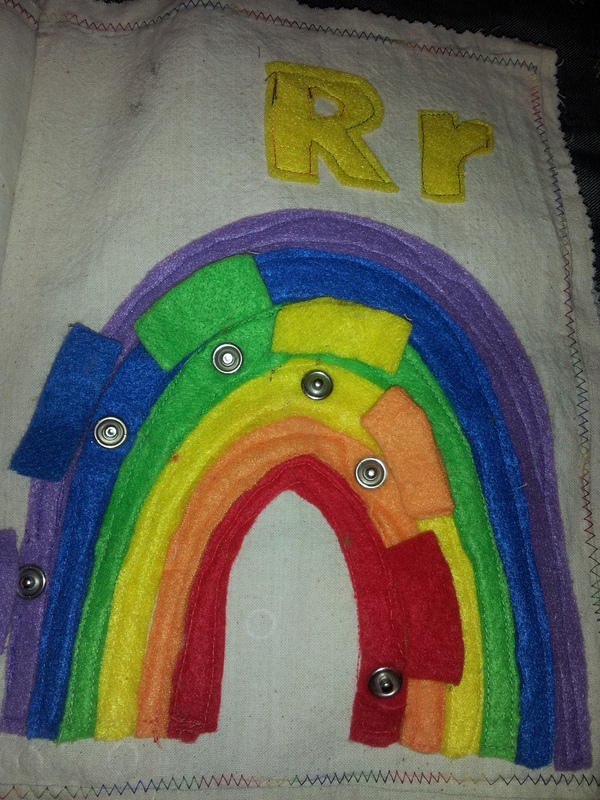 R is for Rainbow — the smaller felt pieces snap onto the corresponding colors on the rainbow. (I was disappointed with this page — I couldn’t get the sew on snaps to be snug enough. 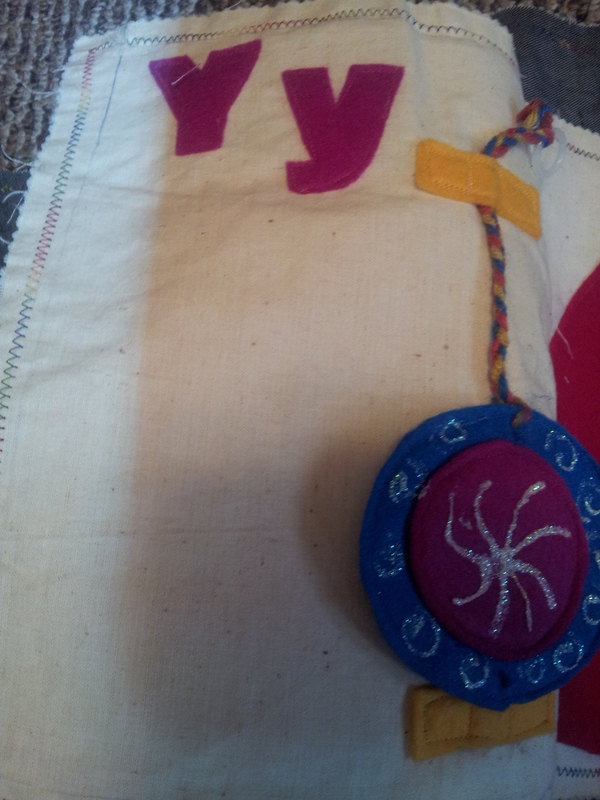 And I also couldn’t sew tightly around the snaps, so the whole page is a bit wobbly. Likely not strong enough to hold up to a toddler’s determination. I encourage Mamacita to just point to the colors now to stave off the inevitable downfall of this page. S is for Shapes — Shape matching; another classic page. 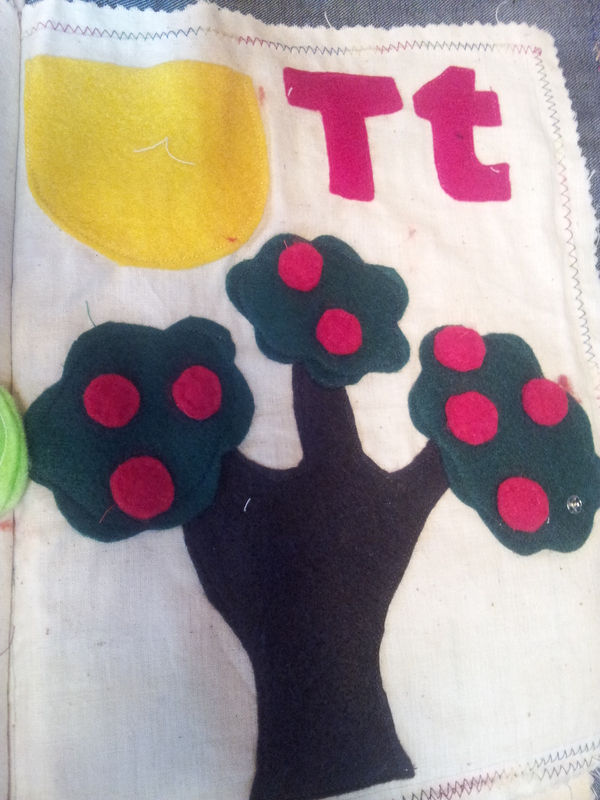 T is for Tree — You can snap the apples on and off the tree. This could be a cool counting game too. The apples can be stored in the yellow basket. One apple has already disappeared. U is for Umbrella — the narrower internal page can be flipped to show an open or closed umbrella that corresponds to the weather. I love this page. 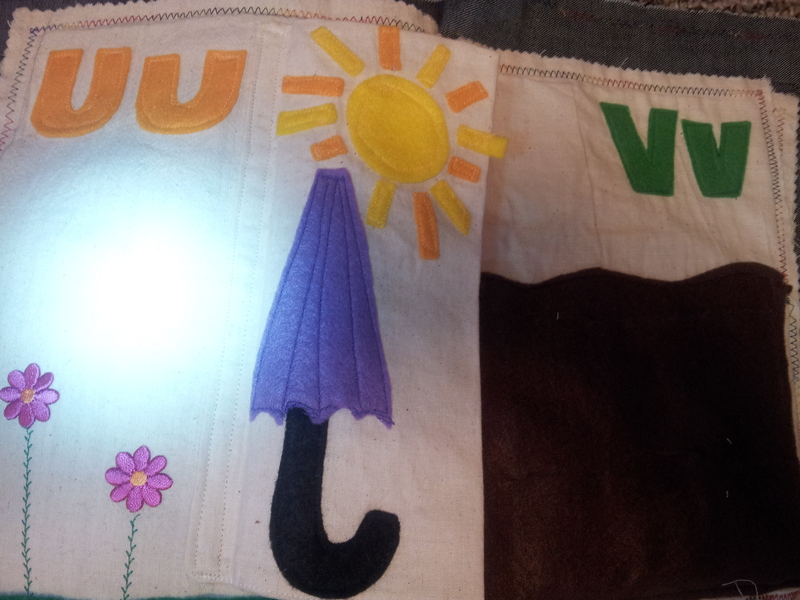 It’s pretty much straight out of A-B-C 1-2-3 Craft Book. 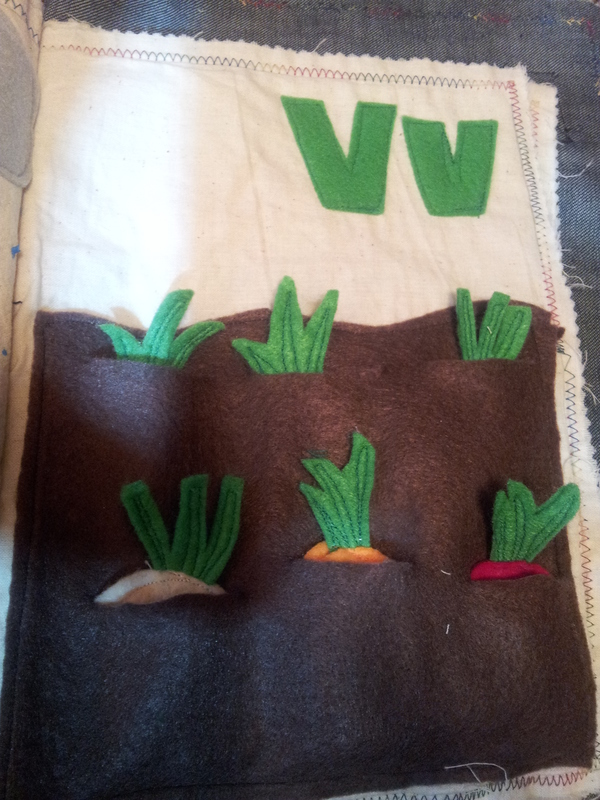 V is for Vegetable Garden — you can harvest the carrots, radishes, and onions from the garden. 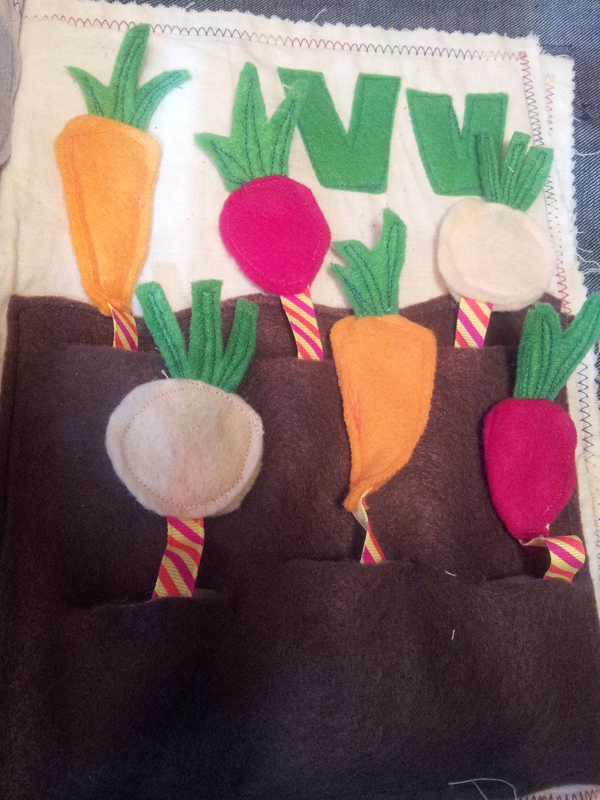 But you can’t lose or hide your veggies, because I cleverly attached them with a ribbon. This is one of my favorite pages too. 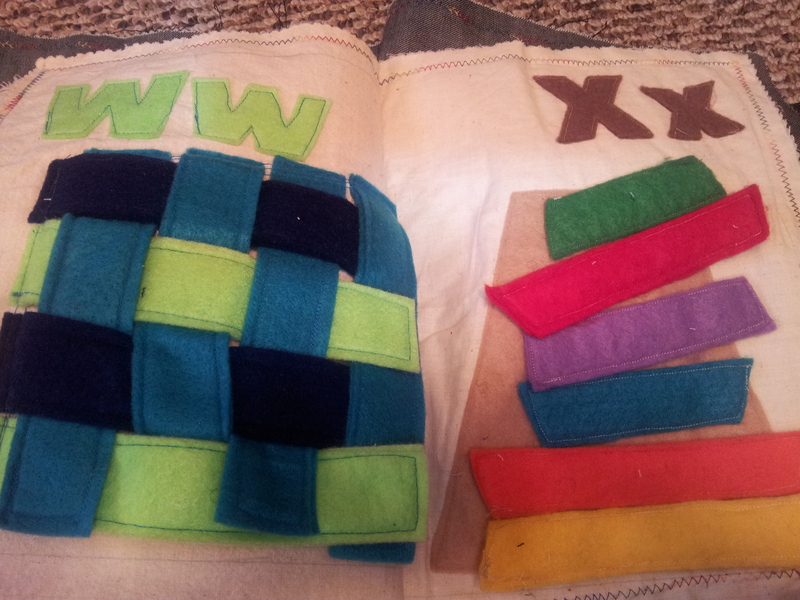 W is for Weaving — the strips of felt can be woven together in a pattern. I love this page, and as I mentioned, this is one that really engages Snaggle, who is currently 6 years old. 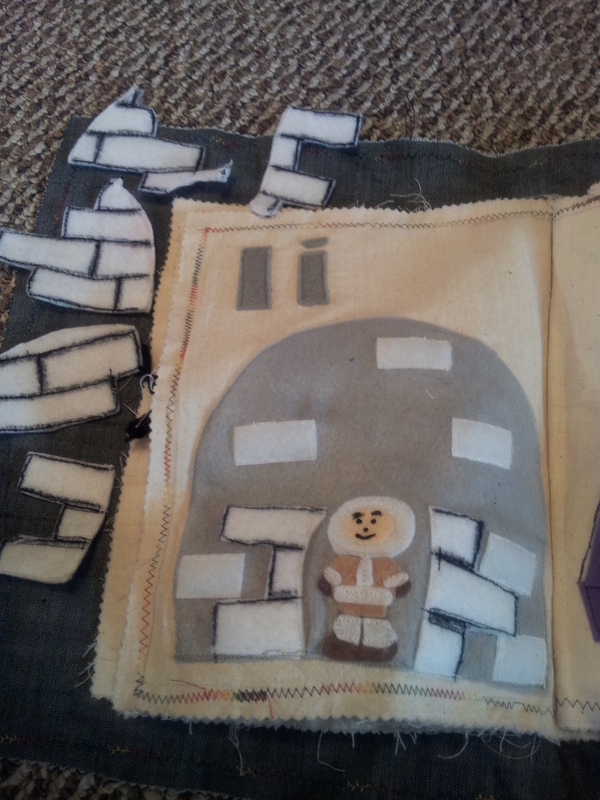 The only thing I wish I had done differently is kept the felt strips in a single layer. I doubled them up thinking it would be better to have them be stronger and thicker, but it ended up being a little too thick to weave properly once you get to the final strips. X is for Xylophone — the parts of the xylophone need to be arranged from smallest to largest. They attach with velcro. Y is for Yoyo — the yoyo is supposed to be able to be pulled up and down, but it already broke! The bottom part of the string came off. This was another imperfect and problematic page. I’ve been meaning to try to reassemble. 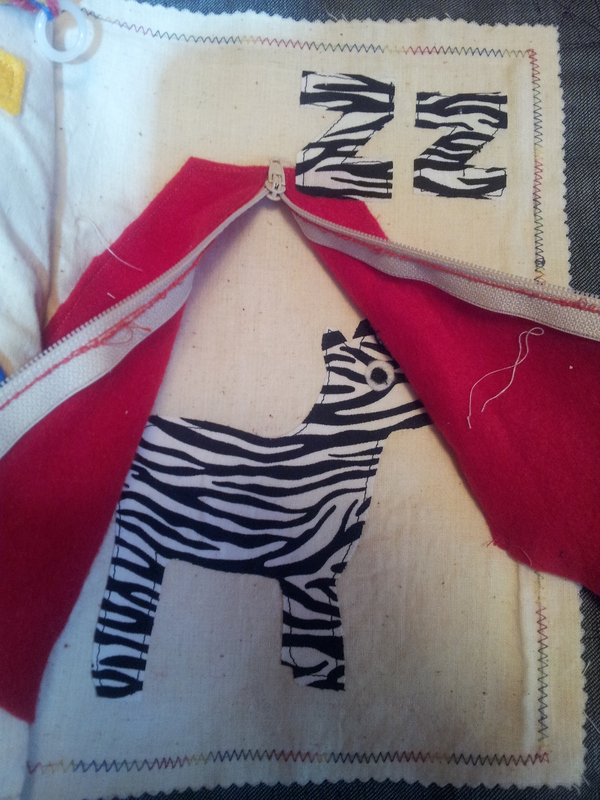 Z is for Zebra (and Zipper) — the little red tent thingamajig can be unzipped to reveal the zebra looking thingamajig underneath. 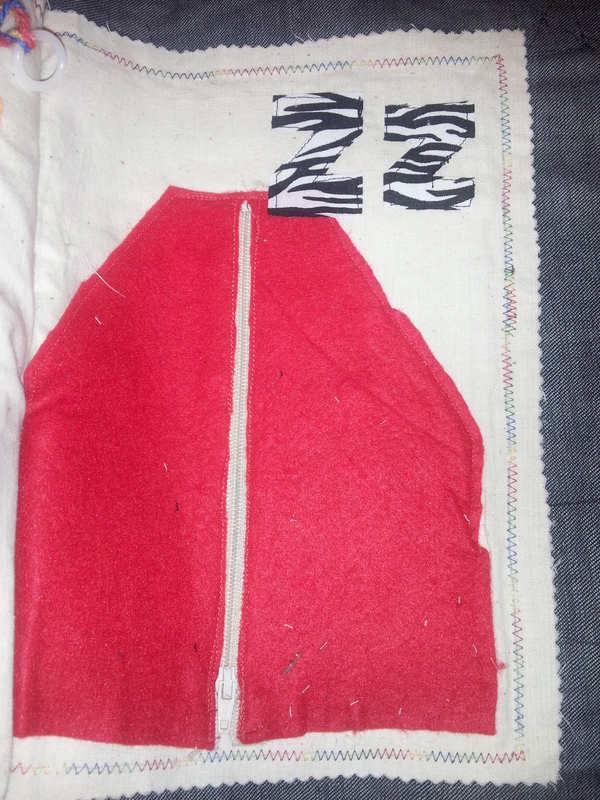 This was my first time sewing a zipper. I was really nervous about it. 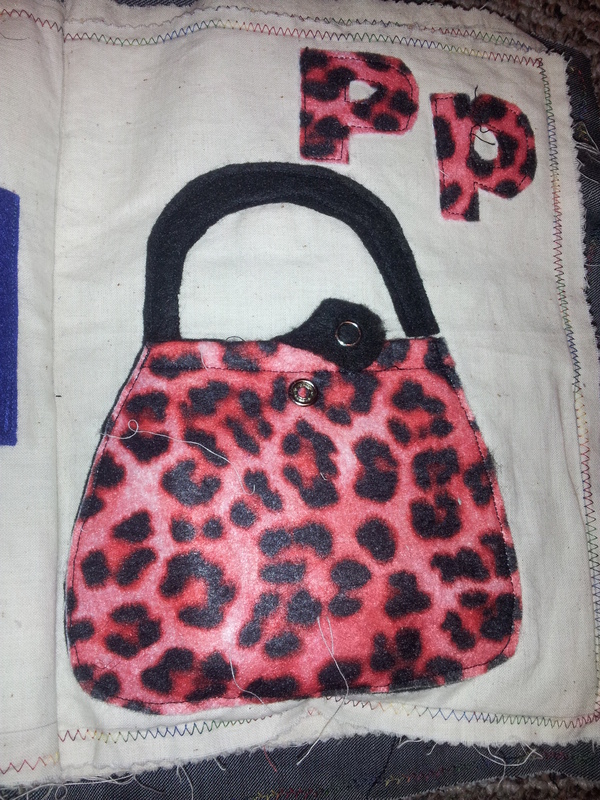 Now I feel motivated to tackle it in a real, practical project, like a tote bag. The final thing to discuss is the binding method. I followed the instructions in 26 Lively Letters, which involves stitching pages back to back — she instructs you which pages to create side by side so that when you sew the pages together at the end, they end up in alphabetical order. But the book ended up being as thick as a phone book though. 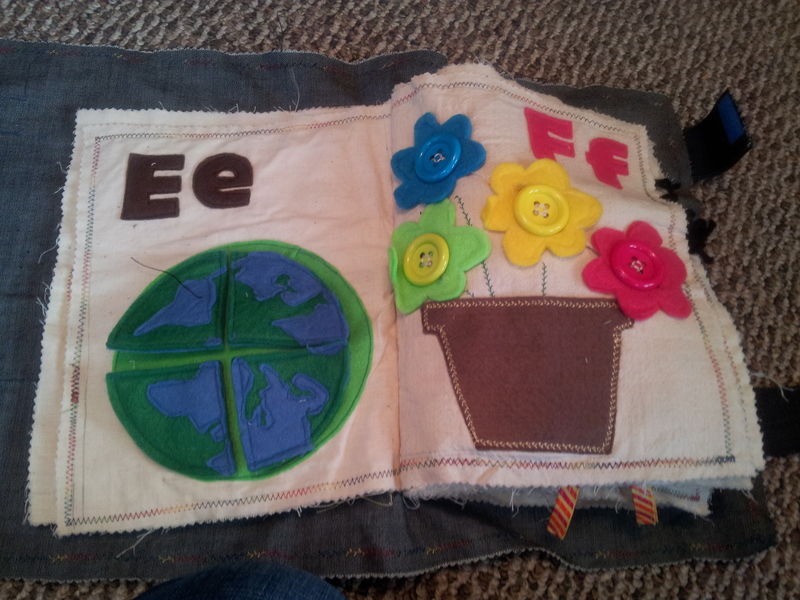 I put a denim cover on it, and then had to stitch the pages and the cover together down the center of the book. This was a challenge! After some crooked stitches, broken needles, and muttered curse words on my part, I finally got it together. 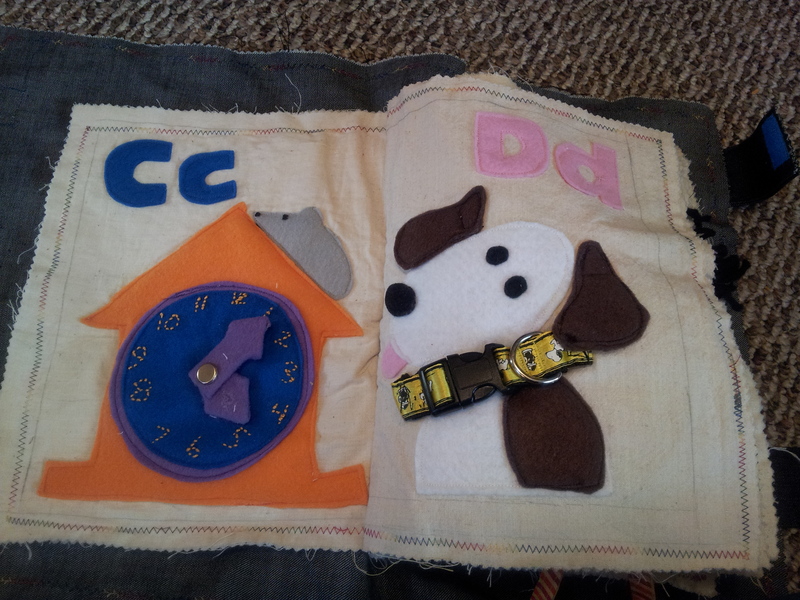 I also sewed on a handle and straps to close the book with velcro. It all looks really janky, or wonky as I’ve seen crafters call it. (unfortunately, or maybe fortunately, I don’t have pictures of the cover). But it hasn’t fallen apart yet so I’m rolling with it for now. 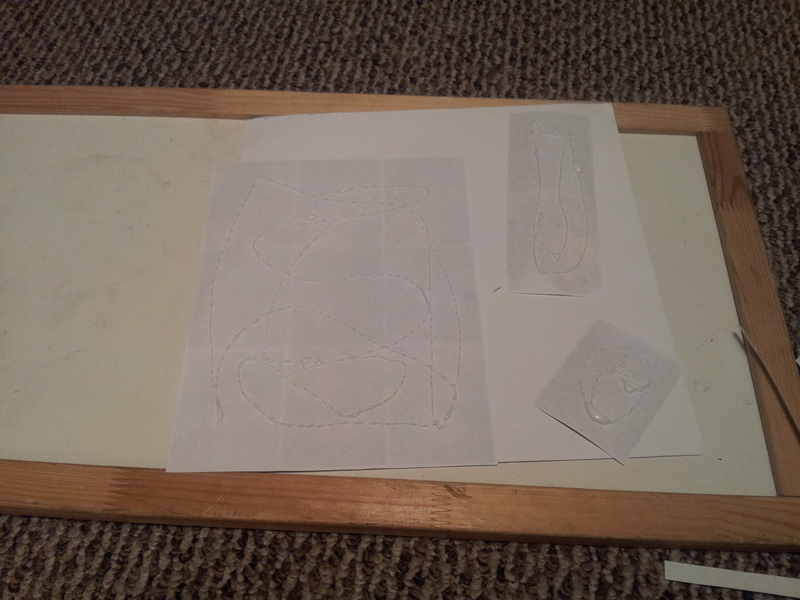 Since I’ve finished, I’ve seen people do the three hole method so that the page can fit in a three-ring binder. That seems like a really good idea. Well, if anyone has any questions about the Quiet Book, please let me know. I’ll see if I can help. Thanks for listening! This entry was posted in Uncategorized on March 2, 2013 by crunchysoul. Here’s my Quiet Book reveal! If you’re interested in the long sordid story of how this book came to be, please continue reading. If you just want to get to the book, feel free to skip to the pictures below, and look out for my upcoming post that goes through the book page by page. I got bit by the Quiet Book bug when Snaggle was just a tot, probably some time in late 2007 or early 2008. I had just gotten my first sewing machine. (Yep, I had made the big plunge and paid a whopping $99 for it at Wal-mart of all places.) I had one sewing class under my belt, but didn’t feel very confident threading my own machine or sewing a straight line for that matter. 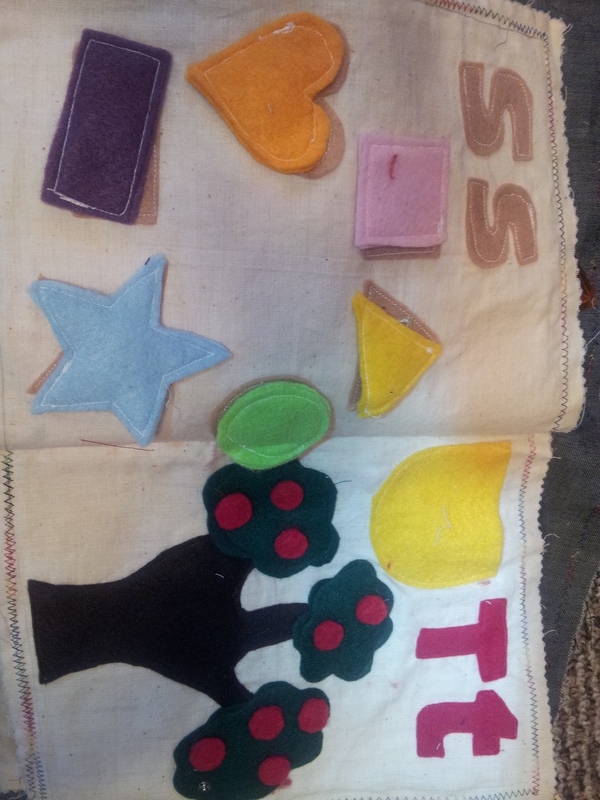 I was skimming the craft section of my library during my lunch break and found a book called 26 Lively Letters, and I was captivated by the whole idea of a book, made by little old me, that would help her learn the alphabet. The additional benefit of it keeping her “quiet” did not sink in then, though now several kids later, I totally get that appeal. Totally. I ended up checking the book out, renewing it a few times, then just broke down and bought a used copy off Amazon. I later found another book, called A-B-C 1-2-3 Craft Book that I used for additional ideas and for all my letter templates. And of course, between the time that I first saw 26 Lively Letters and now, I have learned about the tons of quiet books posted all over the internet. 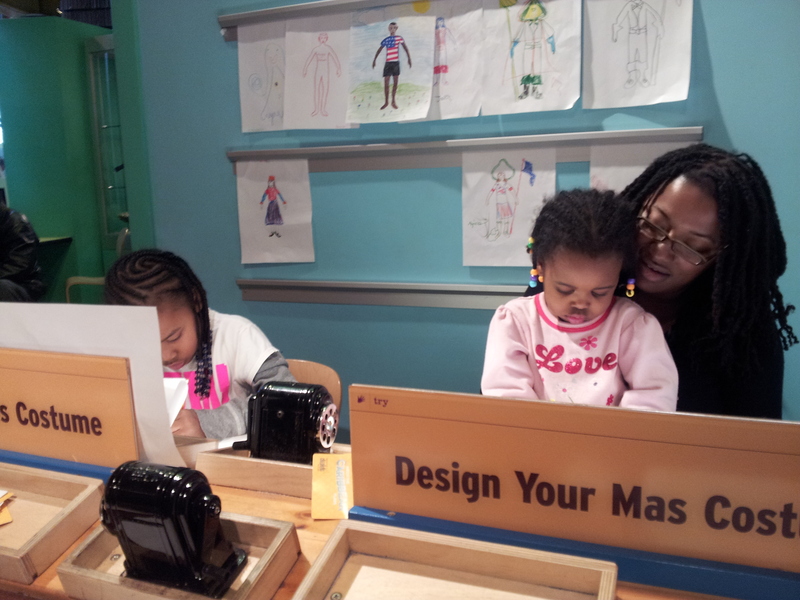 Some of these moms (and dads, I would imagine) are so amazingly creative that it got to be a bit overwhelming. Sometimes I definitely got intimidated by all of the cool pages I saw. I borrowed ideas here and there, but unfortunately didn’t track them all (so if you see your page adapted in my book, I hope you’ll be flattered instead of upset). I did start using a Pinterest board to keep track of some of my inspiration. I stopped and started over the years on my book — at times I cursed myself for committing to doing the entire alphabet, because I could have just done the five letters of Snaggle’s name, or the activities only with no letters at all. But,as I mentioned in my previous post, I found my second third wind once I was pregnant with Omega and pushed on through to finish it right around the time she was born. I still could probably put one more finishing touch by writing in instructions, as the author does in 26 Lively Letters, but the kids seem fine playing with it as is. 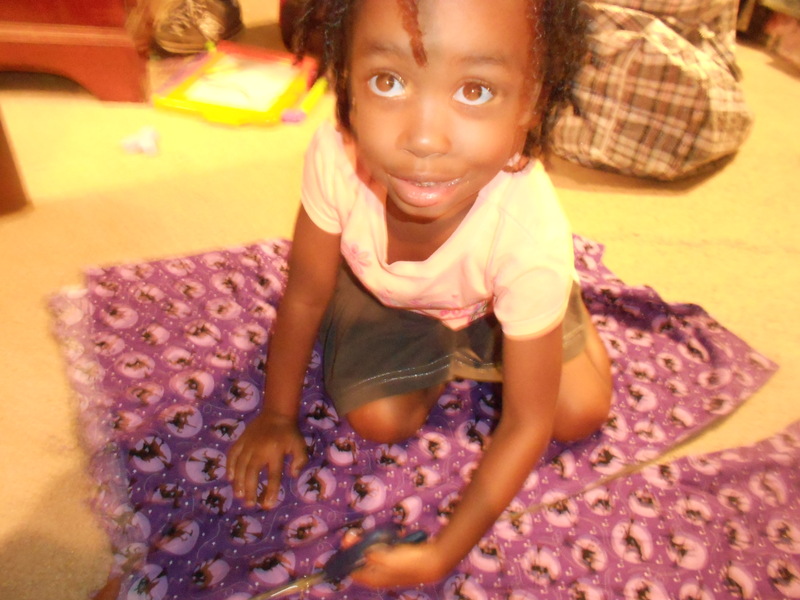 Snaggle, who is now 6, loves weaving the mat on the W page and playing tic tac toe on the G page, and Mamacita loves the xylophone page, the shapes, and the dog collar. I can’t wait to see which pages Omega enjoys. Because you’d best believe this book will stay in this family for a LONG time if I have anything to say about it. I joked with my husband that I would only entertain offers of five figures or more to part with it. During the igloo and earth pages, that went up to six figures! And there you have it, folks. Five years of work for your quiet book enjoyment. 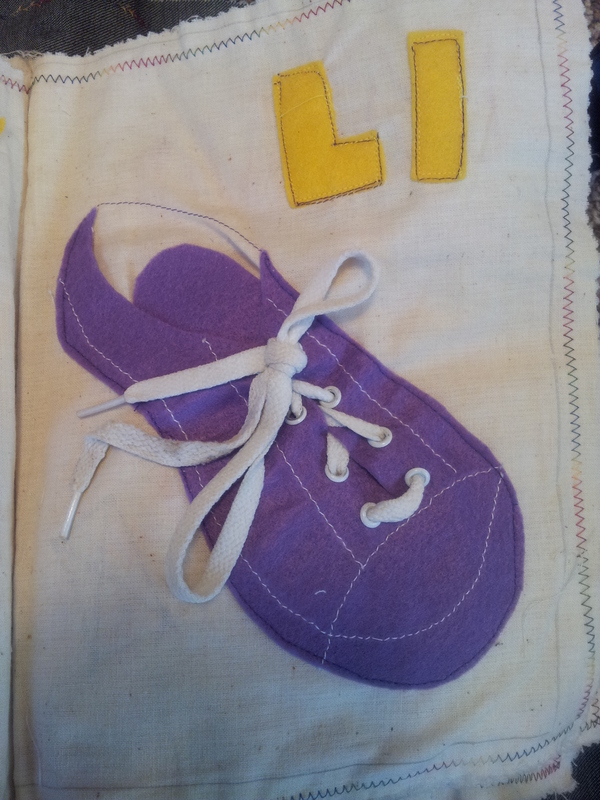 I vowed I would never do another one, but now I’m thinking of ideas for a friend’s child and for my nephew too. Go figure (the things we do for the little ones in our lives). You can bet those will be shorter books though. I usually don’t endorse “Nevers” because it’s not good to close yourself off from things. 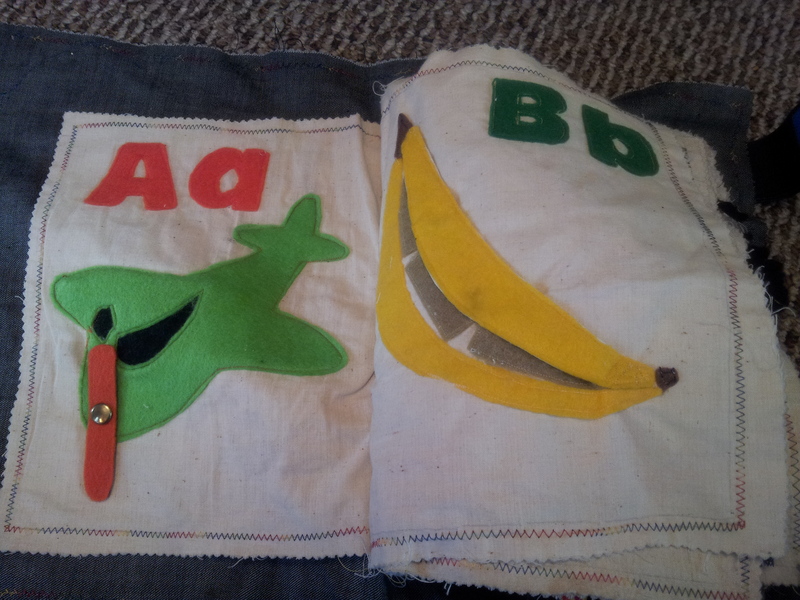 In this case, however, it is safe to say I will NEVER attempt a complete alphabet quiet book again. But I am glad to have done it once. Stay tuned for my next post that will go through the activities on each page. 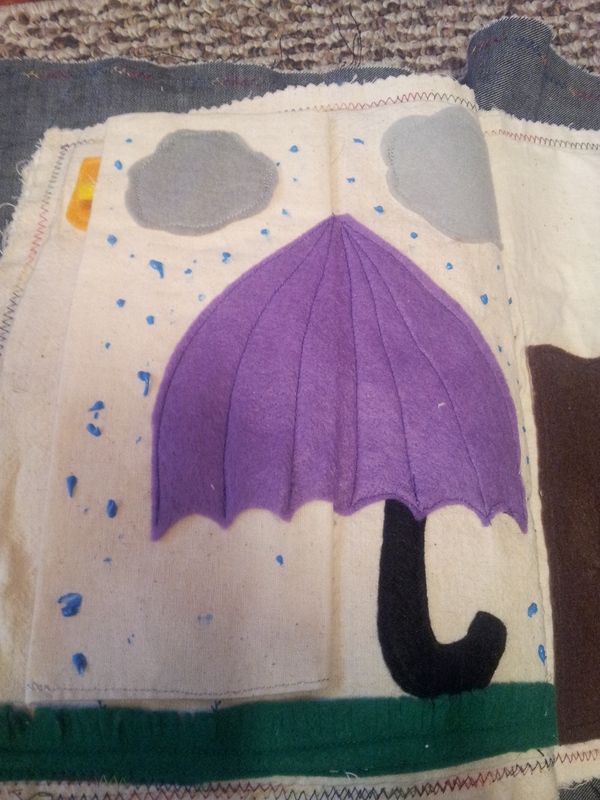 This entry was posted in Quiet book and tagged Crafts, Quiet book on February 28, 2013 by crunchysoul. Hello Blogosphere — how the heck have you been? If you’ve been following this blog (Anyone….anyone?) you’ll notice that I’ve taken an extended absence. Now, I’ve noticed that other bloggers tend to apologize for falling off. But I won’t be a cliche. I’m not going to apologize for disappearing. No, I’m going to make excuses instead. 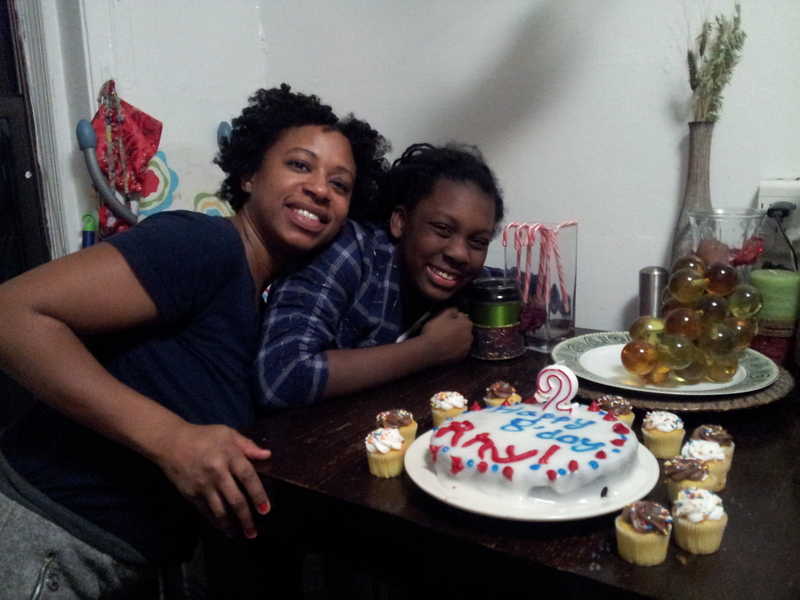 I’ve had two reasons for not blogging since last winter. Two darn good reasons, if you ask me. 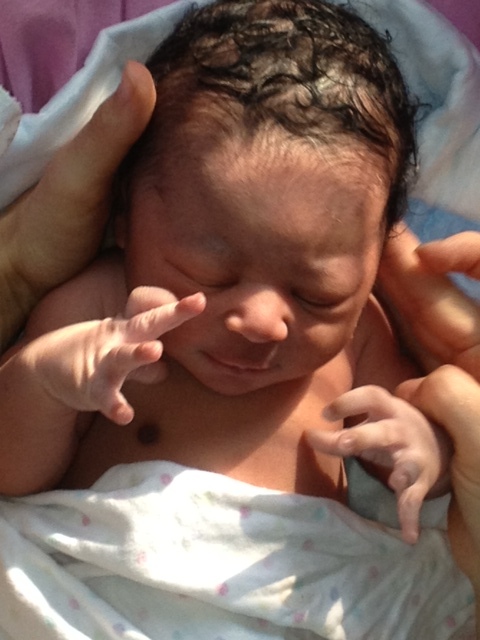 The first reason: This cute and cuddly little munchkin here, Baby Z, born on September 6th! (For blogging purposes, her nickname will be “Omega,” for not only does her name start with the last letter of the alphabet, but she is indeed the last if you catch my drift.) 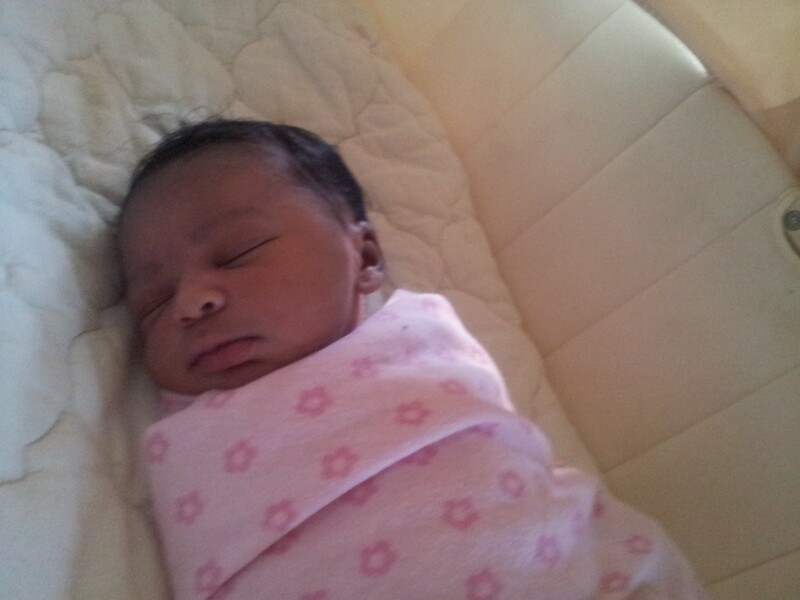 I had her at home, which was an amazing experience and one that I will need to explore further in a later post. We spent a lot of time before Omega got here stepping up our house game a little bit. Some of it even involved outside contractors (!) 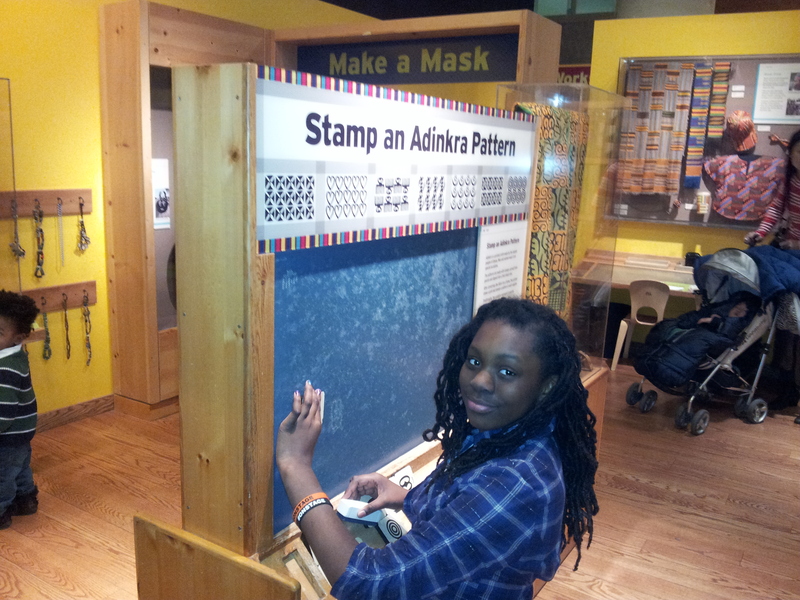 which was definitely a new experience for me. We had to move Mamacita out of the nursery and in with Sunny and Snaggle and seriously needed to maximize our storage. We had some electrical work done, added shelves, knocked out a wall in a closet. I should give K most of the credit. When I got into my nesting mania, he stayed calm and cool and just got it done. He also found and dealt with most of the contractors too (he even found one in the aisles of Home Depot and brought him home one day — that’s the guy who did our closet.) I still want to put in some finishing touches to the girls’ room too. 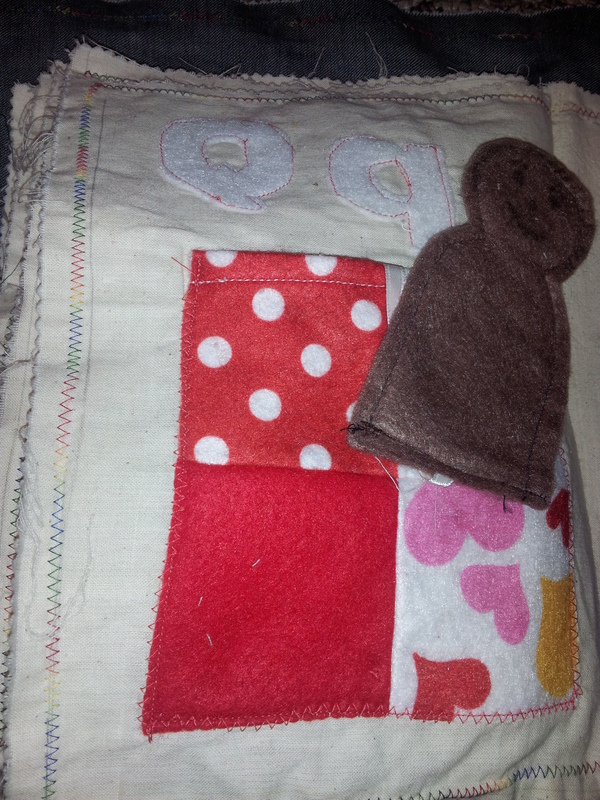 The second reason: My cute and cuddly ABC Quiet book! I finally finished it. This is a picture of Snaggle helping me with the title page. More photos of the actual book to come. I originally started this book around 2008 for Snaggle. I finished about 8 pages or so and then realized how much of a commitment it would be to cover the entire alphabet…I don’t think it dawned on me that 26 letters meant 26 pages, 26 unique designs, 52 letters to trace and cut and sew, 26 pictures, 26 activities with some intricate sewing involved, you get the idea. And I was a beginning sewer at the time. Ultimately I got overwhelmed and my momentum petered out. But ironically, it was Omega who gave me the motivation to start again. I figured I’d need something to keep Mamacita busy while I dealt with a new baby. Plus, now I’d know I’d have someone in the pipeline to play with after Mamacita, so it would get some use over time. Lo and behold, I delivered both these babies at roughly the same time. I literally finished the book a few days before Omega made her arrival. 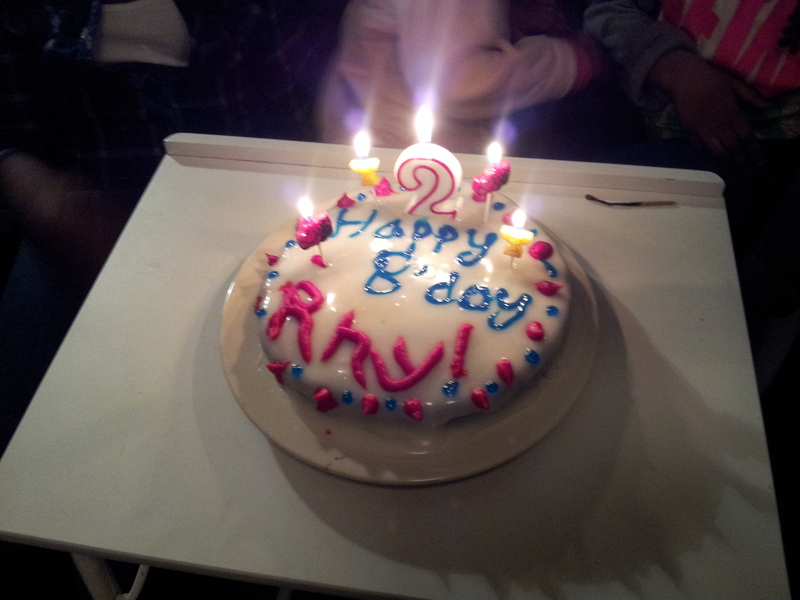 Good thing she came 10 days late! Needless to say, I also found out how difficult it is to blog regularly while working full-time, being pregnant/caring for a newborn, parenting other kids, and finishing projects to feature on said blog. So I fell off. I lost my vision for a moment. I’ll forgive myself for it. And like a phoenix, I’ll rise out of the ashes to blog again. Okay, that’s corny and a bit melodramatic. A better metaphor is that like a hooptie fresh out of the auto repair shop, I’ll keep on pushing. There’s no guarantee that I won’t break down on the side of the road again, but I’ll keep on going until I can refuel. Or recharge my battery. Or get a new engine. You get the idea…. Plus, January is the best time for fresh starts, isn’t it? My goal is to blog “regularly” but to keep it manageable. That might mean once or twice a month folks, less regularly than the superstar bloggers of the world, but it’ll be the best I can do. 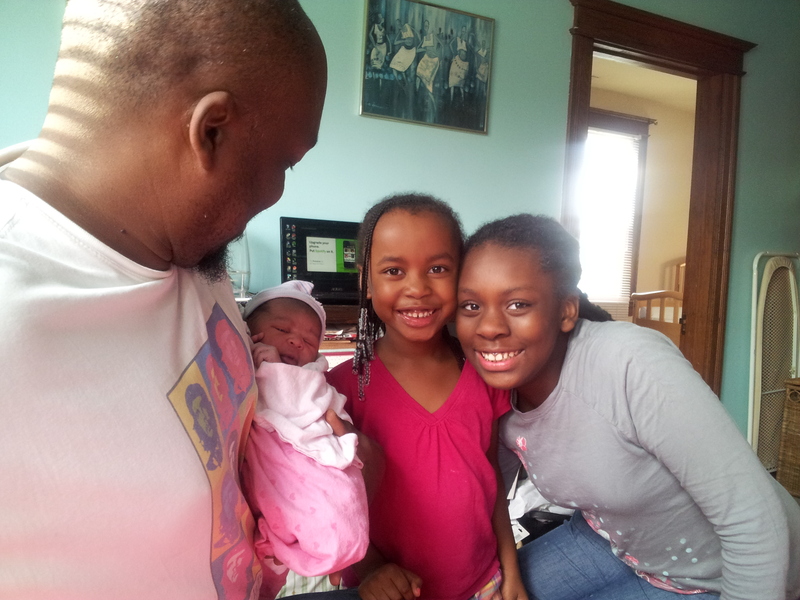 Stay posted for more on the Quiet Book and the home birth. 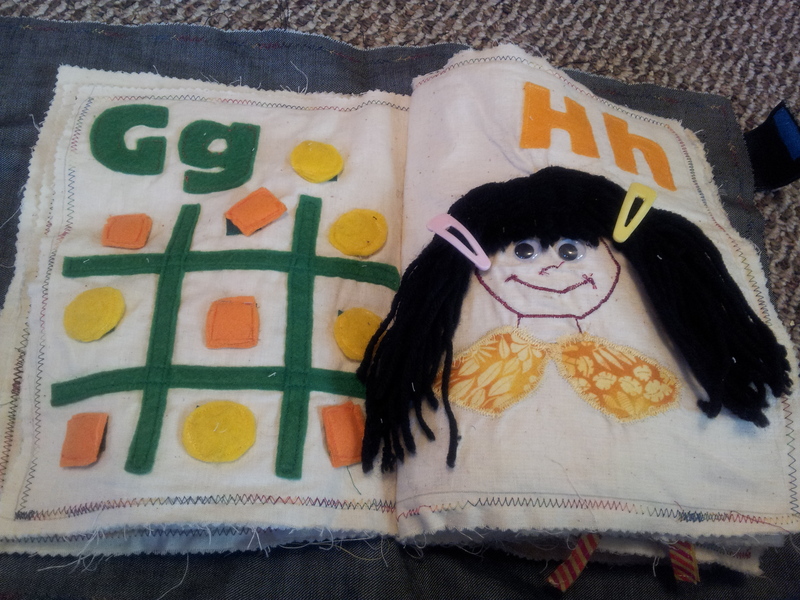 This entry was posted in Family life, Infants, Quiet book on January 9, 2013 by crunchysoul. 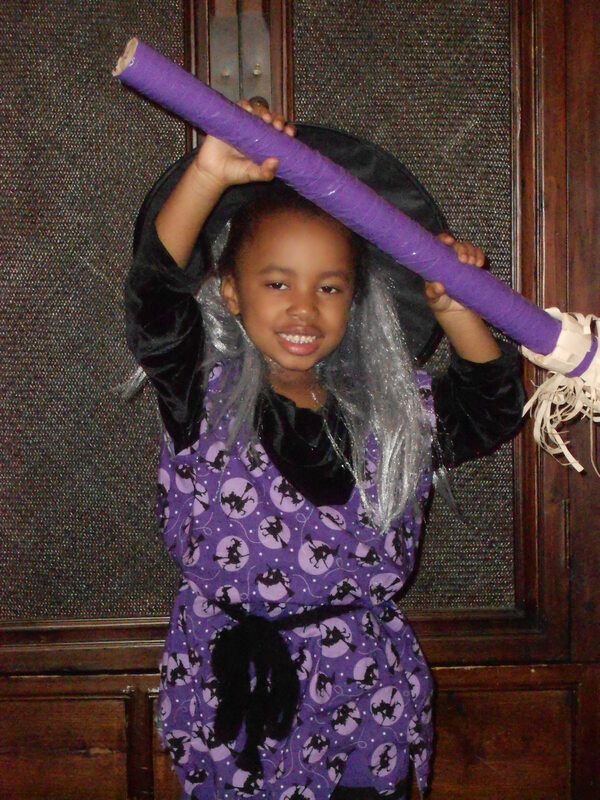 Just wanted to share the final element of Snaggle’s halloween costume, the witch’s broomstick. This is a cute little accessory that I made out of those ubiquitous toilet paper rolls. It’s funny, though, as it got closer to Halloween night, I wasn’t sure that I would have enough rolls, so I started taking some home from work. Then I didn’t want to carry them in my work bag which is ALWAYS stuffed in case they got crushed,so I just carried them home on the train. I can only imagine how strange I looked to fellow Metro riders. 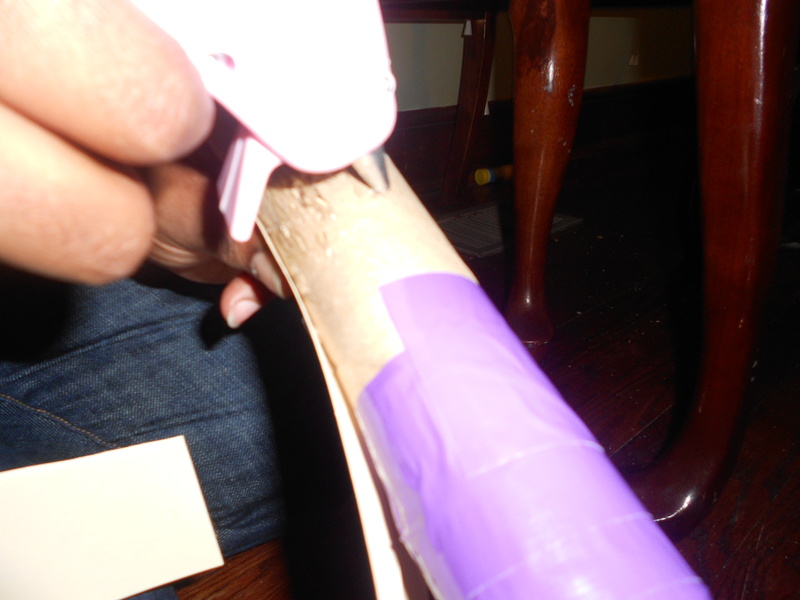 I started by using the scotch tape to hold the toilet paper rolls together. I kept taping until I had the length that I wanted. In retrospect, it would have been better to use paper towel rolls because I would have needed fewer, but it worked out just as well with the toilet paper rolls. 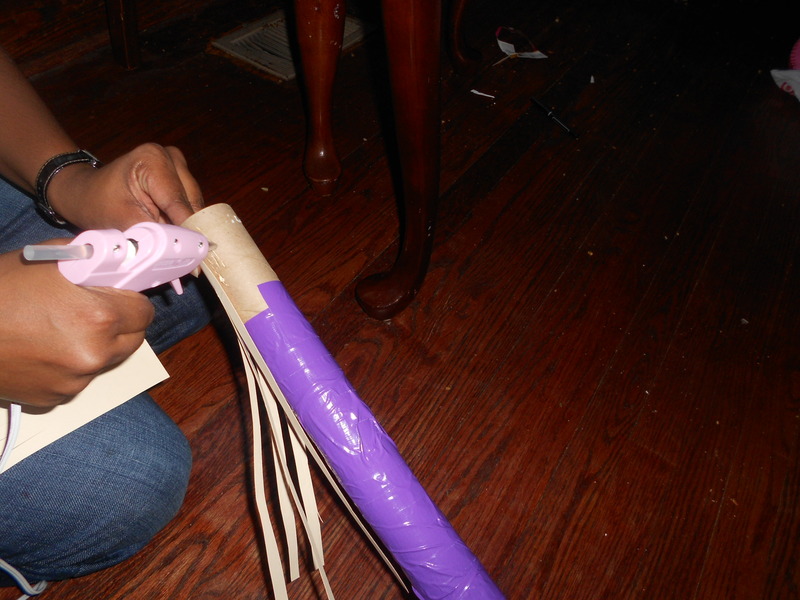 Then I wrapped the tube I created with the purple duct tape. I figured this had the benefit of fortifying the cardboard and adding a little decoration. I didn’t wrap the last toilet paper roll completely; I left a little bit of cardboard exposed at the end of the last roll so that I could attach the manila folders. I prepped the manilla folders by cutting them into sections a few inches wide and 10-12 inches long. The sizes varied a bit as you can see in the second picture below. 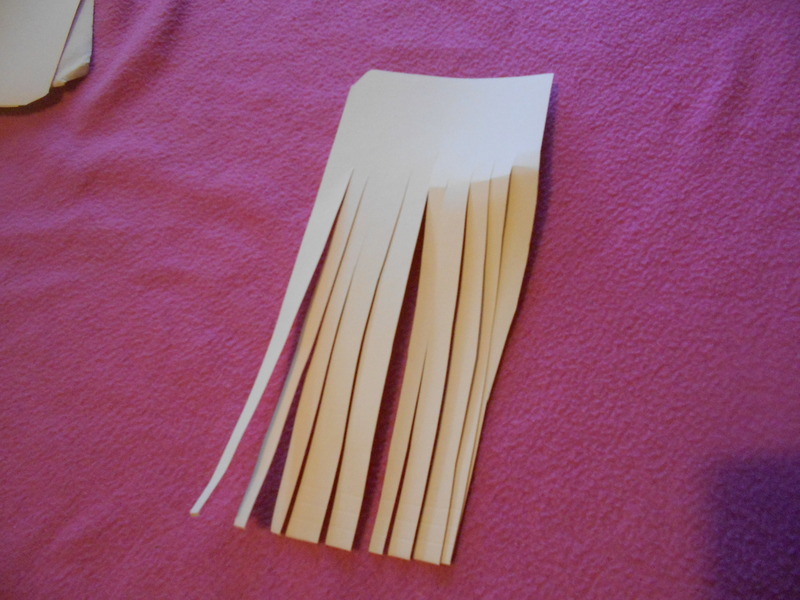 I cut the longer end into strips but left about 5 or so inches uncut. 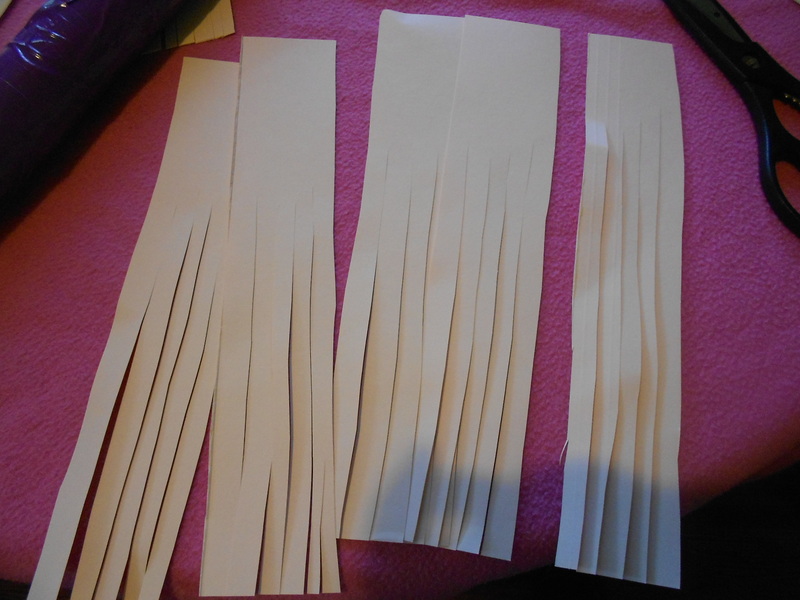 Here’s what a section looked like after I cut the strips. 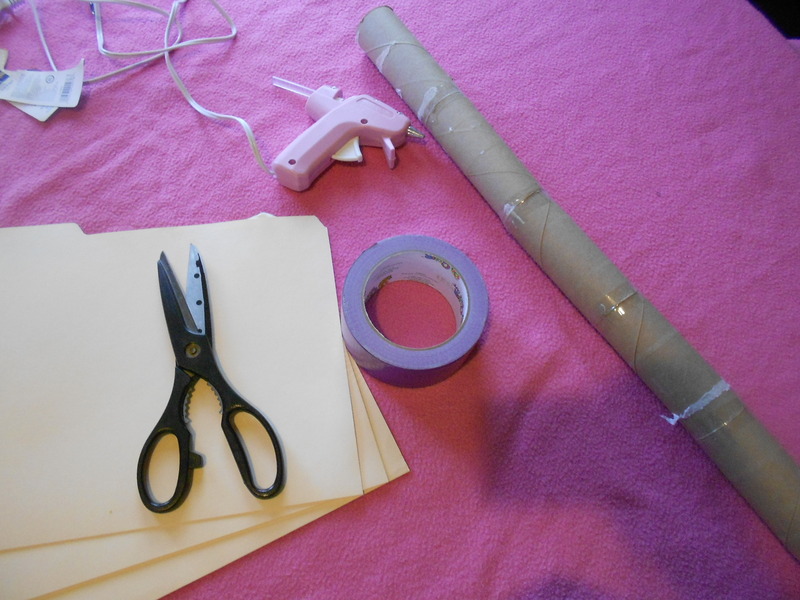 Next, I used my glue gun to hot glue the manila folders onto the tube. Hope someone finds this helpful. It was fun to make, and Snaggle liked her little accessory. And making it out of toilet paper rolls was not only green, but was also injury free. No one got hurt as they were playing around with it! This entry was posted in Green crafting, Halloween and tagged green crafting, homemade witch costume, homemade witch's broomstick, repurposed crafts on January 28, 2012 by crunchysoul. 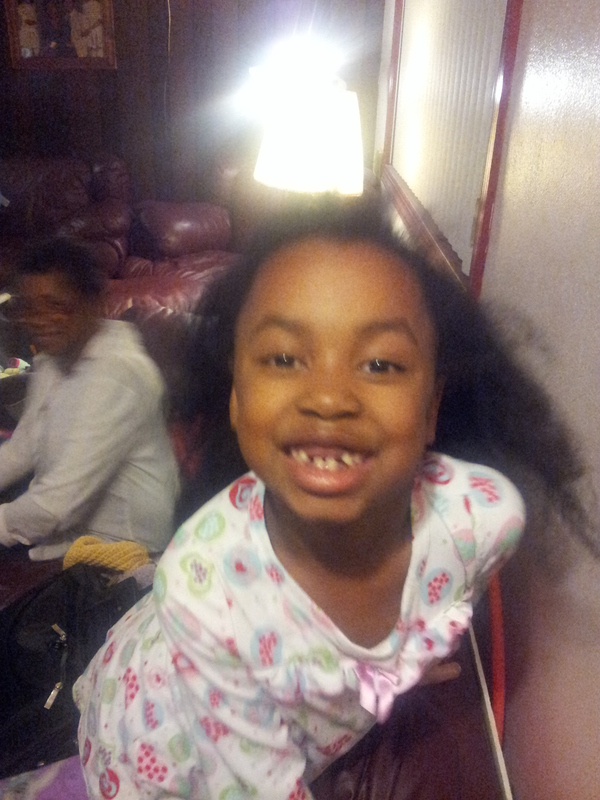 Snaggle decided pretty early on that she wanted to be a witch this year. 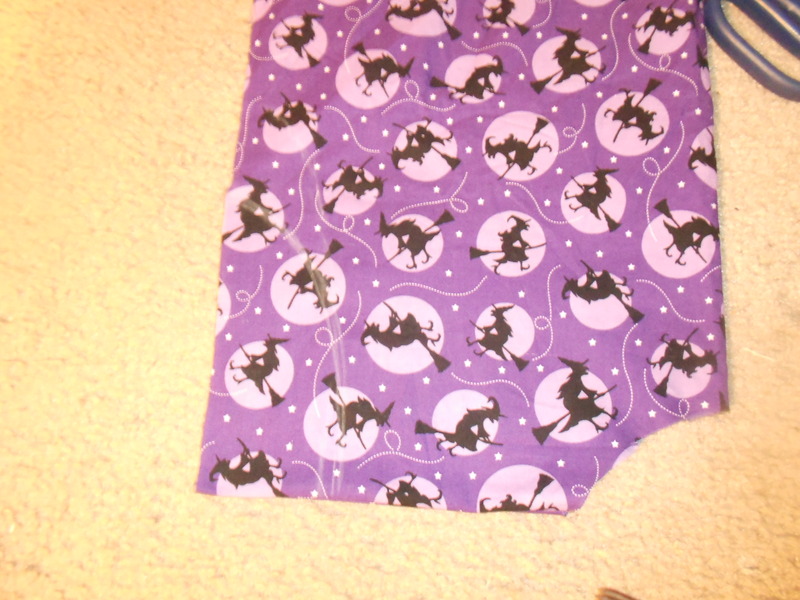 She was with me at the fabric store one day this summer and instantly took a liking to this purple witch fabric. Luckily, it was only like $2 a yard, so I bought a few yards and thought I’d figure out what to do with it later. 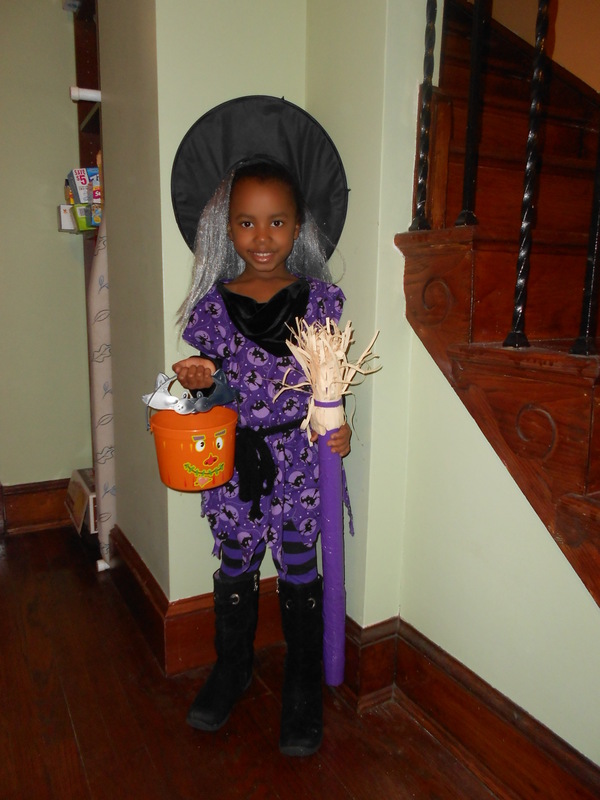 I had no idea how to make a witch’s outfit, and my clothes sewing skills are still in infancy. But I hoped that I could put together some type of tunic and have her wear a black shirt under it. I poked around online, but didn’t find a quick and simple tunic tutorial, and ultimately I put it together myself. Here’s how I did it. 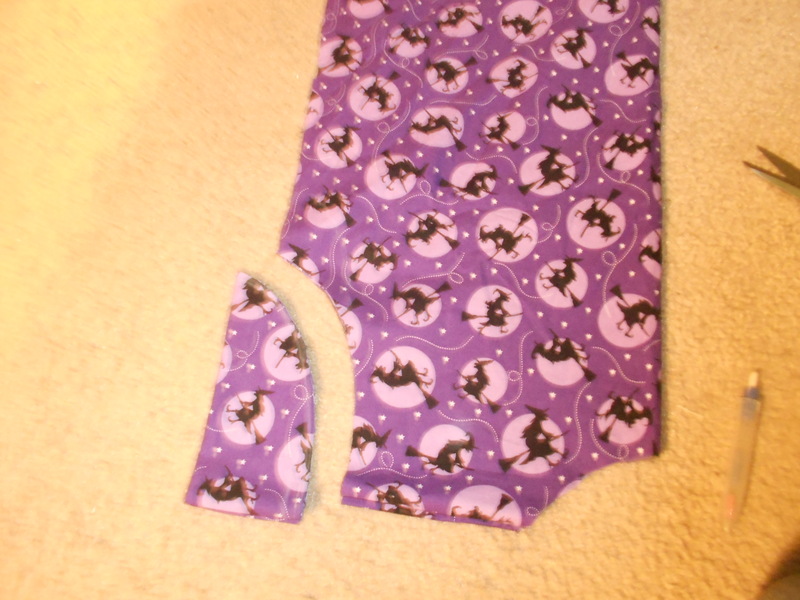 First, I folded the fabric in half vertically and then in half again horizontally. Then I drew a half circle at the spot where the two folds met. You can (just barely) see my chalk line drawn in the photo below. 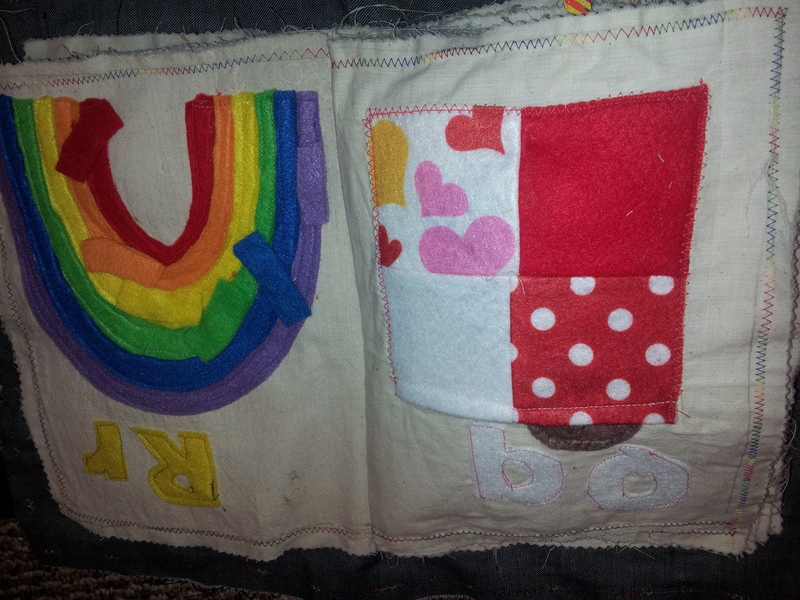 Next, I refolded the fabric again the same way I had done for cutting the head opening. I drew another curve shape at the other side of the fabric (this is the left side of the photo below but is hard to see). Because the fabric is folded twice, I was able to cut through both armholes simultaneously, and make sure the armholes had a similar shape. 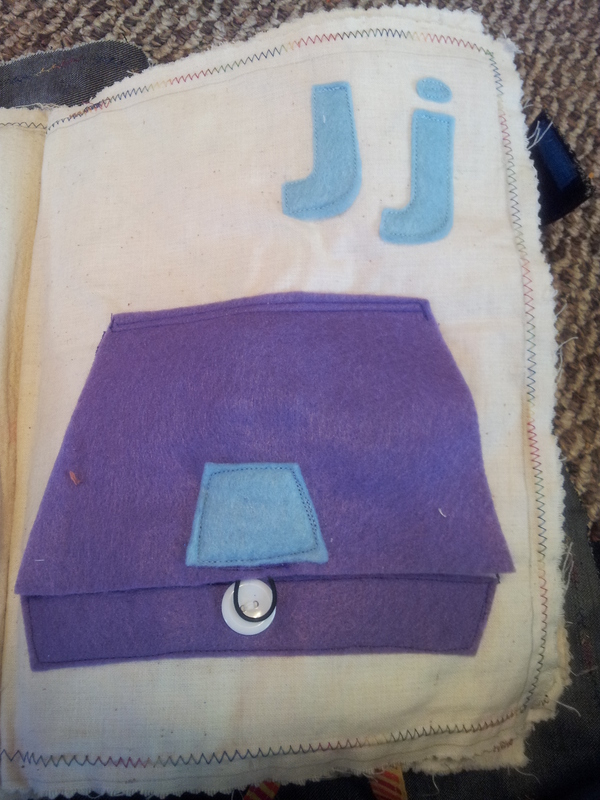 Cutting the armhole wasn’t a necessary step, but I was trying to give some shape to the armholes. 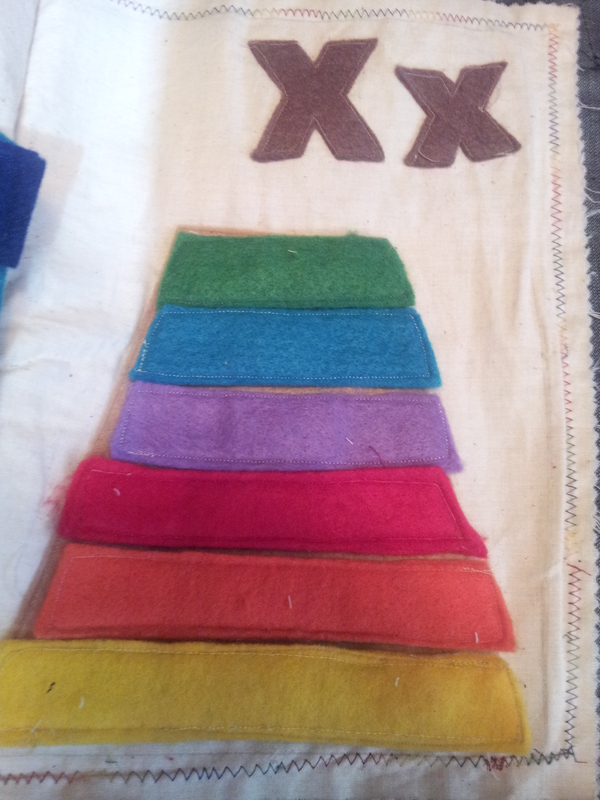 As a next step, I turned the fabric inside out. 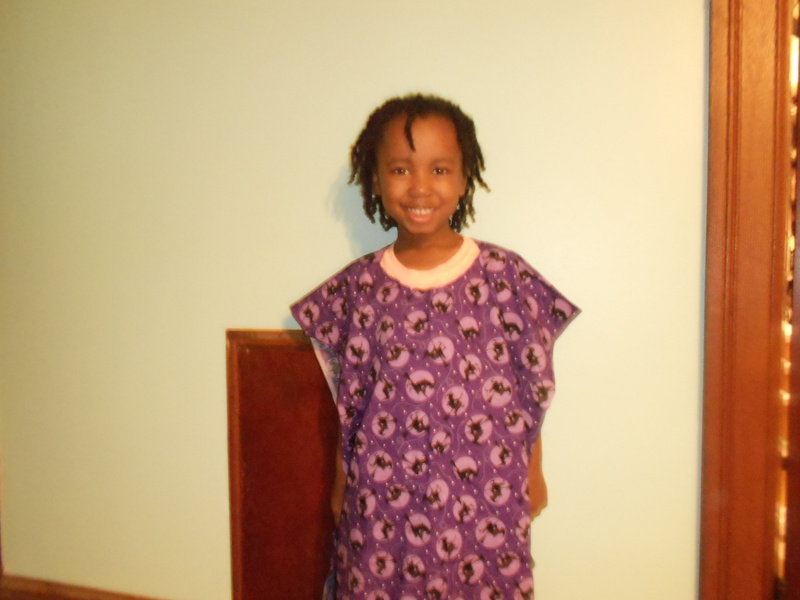 I also shortened the fabric a bit by cutting it down to tunic length — Snaggle helped. No need to do more sewing than necessary, you know what I mean? 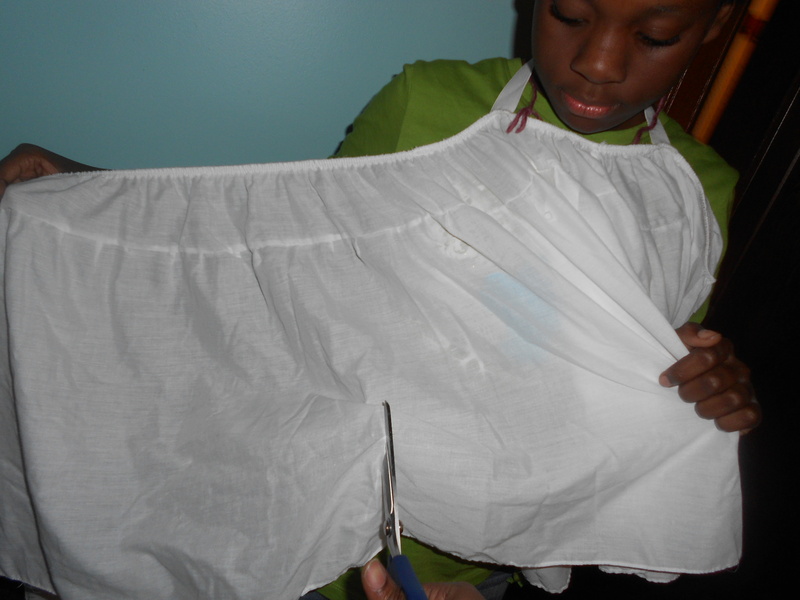 Then I just went to my sewing machine and sewed a straight stitch down from the underarm to the bottom of the tunic. As I sit here writing this, I’m really wishing I had taken more — and better — photos. These tutorials are harder than they look, but I’m a work in progress and will try to do better. By this time, my eager little helper was getting antsy and wanted to move on to something else. I practically had to do some pro wrestling moves to get her to let me do the finishing touch, which was to cut a jagged edge into the bottom of the tunic, to give it a raggedy, witchy feel. As you can imagine, it would have been difficult to get photos of that. 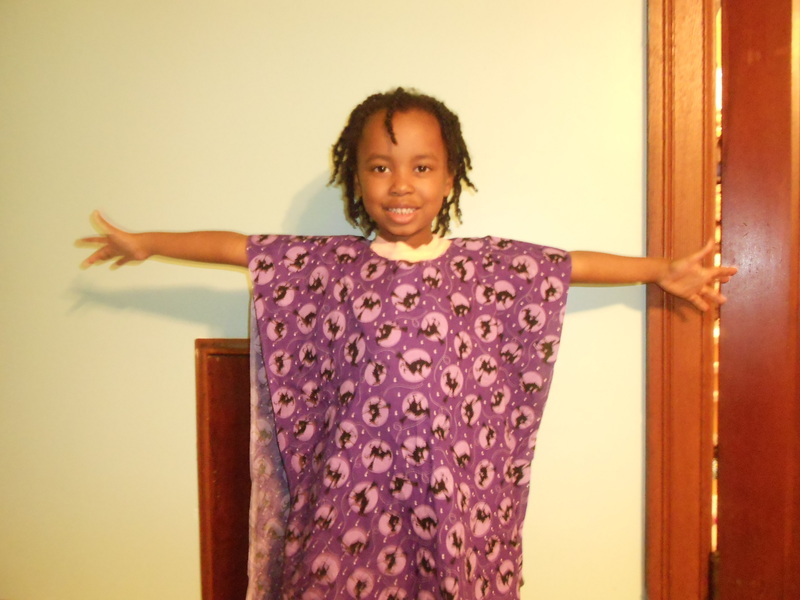 Once the tunic was done, I happened upon the perfect tights for her — at Walmart of all places. I try to stay out of that place, but we needed to make an urgent pitstop for one of the girls one day, and it was the most convenient store. 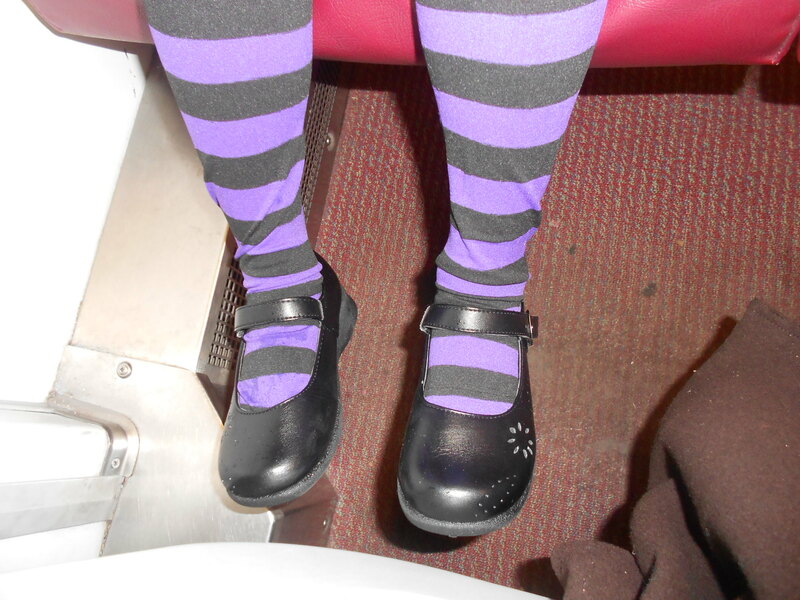 The black and purple tights and the witches hat jumped out at me. As is Walmart’s way, the prices were (suspiciously) cheap, and I gave up my plans to try to make this hat and purchased one instead. Here’s a picture of her riding the Metro in the tights. You can sort of see the jagged bottom in the picture below. I also crocheted a black belt to give some shape to the tunic. It was pretty shapeless, but she was happy with it, and that’s what was most important. 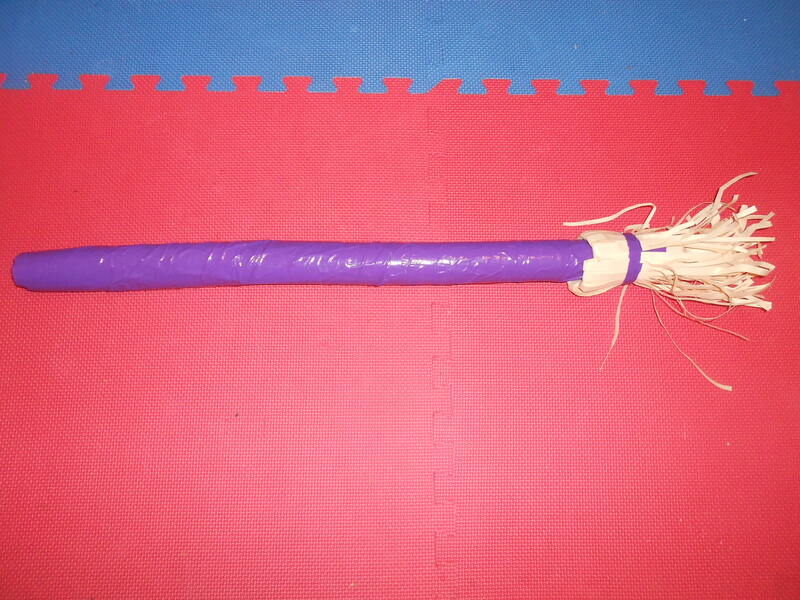 Stay tuned for another tutorial for the witch’s broomstick! 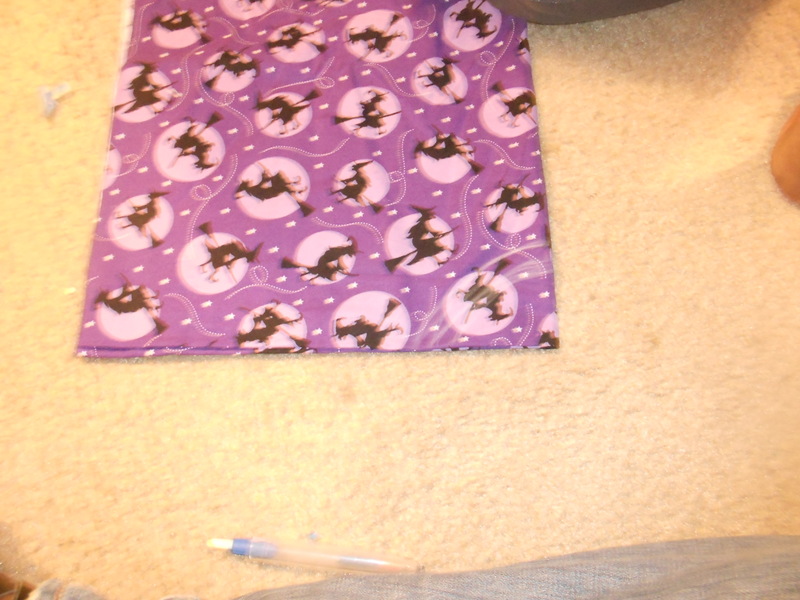 This entry was posted in Halloween, Sewing and tagged homemade witch costume, ragdoll halloween costume, witch halloween costume on December 4, 2011 by crunchysoul. Sunny was pretty clear that she wanted to be a Rag Doll for Halloween this year. I thought it was a cute idea but wasn’t sure how I was going to execute it. I started by looking up other homemade Rag Doll costumes and found this excellent site, aptly named coolest-homemade-costumes.com. I got a little distracted by all the creative ideas, like the baby Chippendale dancer, the Cabbage Patch doll, and the pregnant basketball player. But once I got focused again, I found some helpful costumes. Most of them had a blue print dress and an apron. I was going to put the dress in the hands of the thrift store gods and hope they would send one my way. My clothes-sewing skills are seriously lacking, and I did not want to send Sunny out looking jacked up! Luckily, she found the perfect dress for her costume, all by herself. The thrift store gods heard my call. Next we went hunting for an apron or something apron-like that we could use. In the linen section, we found a white cotton bed sham — for one whopping dollar — and inspiration struck. Suddenly, I had a idea. 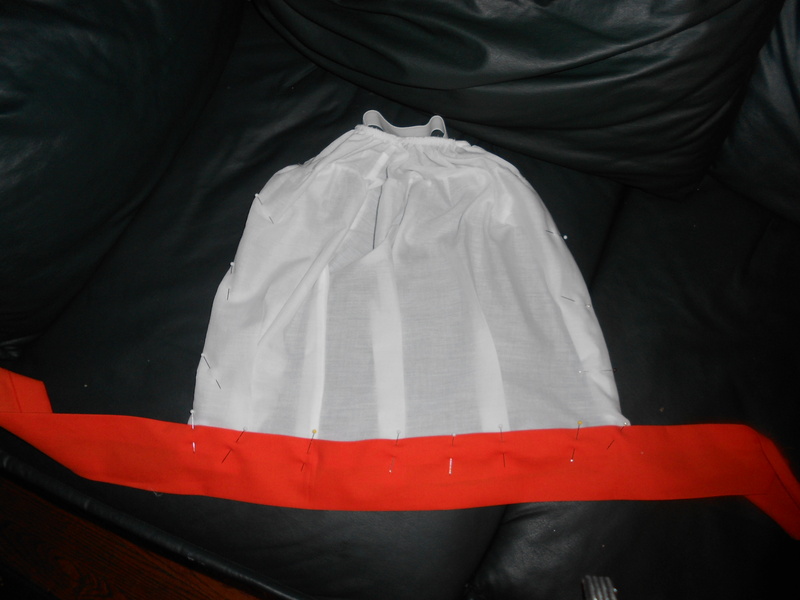 I figured I could cut a section of the sham for the top of the apron, a section for the bottom, and then sew them together onto a long piece of fabric that would also serve as the strap to tie the apron on. As a plus, the sham had wide elastic bands that are intended to be used to hook the sham onto the mattress. This wider band fit over Sunny’s head, saving me from having to sew a neck strap. And the elastic sewn into the edging made a little gathered neckline, so I didn’t have to add that either. Here we are trying to figure our where to cut the two parts of the bed sham to the right length and shape for the apron. 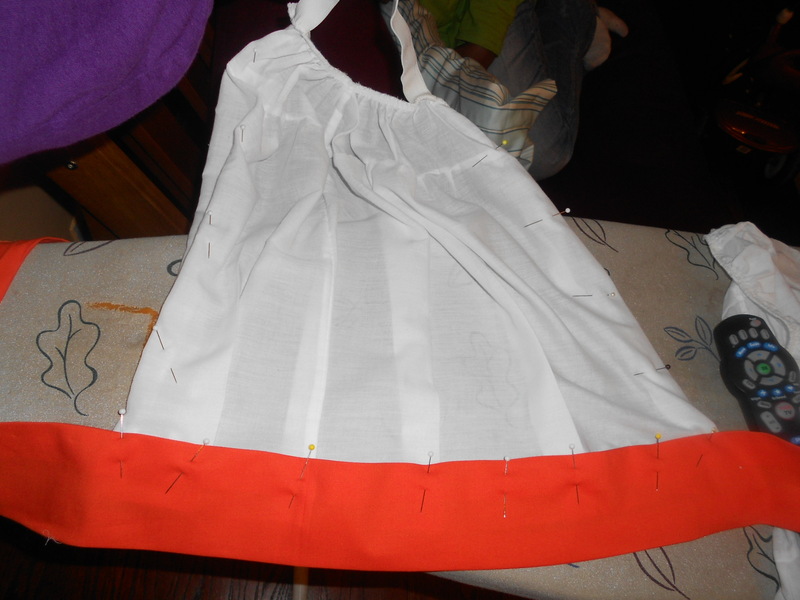 Then, I pinned the strap fabric onto the top part of the apron, as shown above. I had a cute little blue and white fabric with little red accents that would have coordinated with the other parts of the costume, but Sunny insisted on the orange so she wouldn’t be too coordinated. 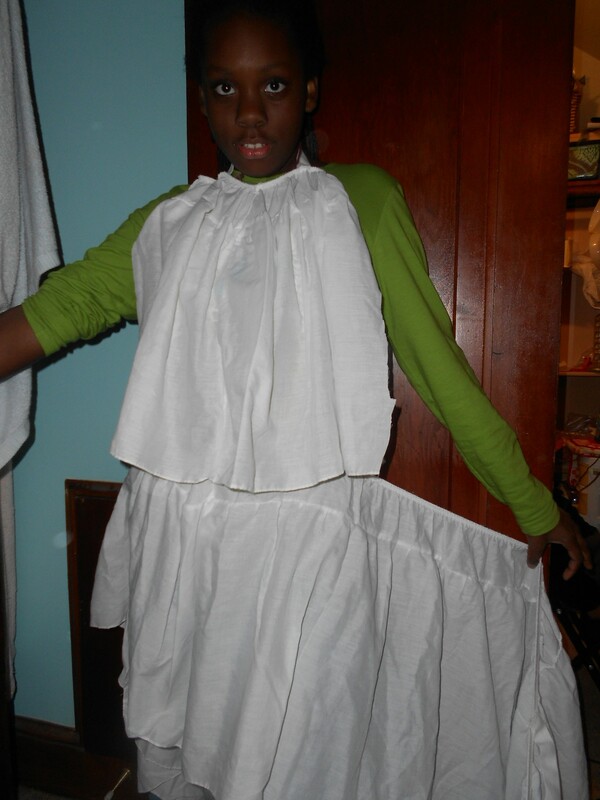 If you notice, I tried to get a little fancy and add pleats! 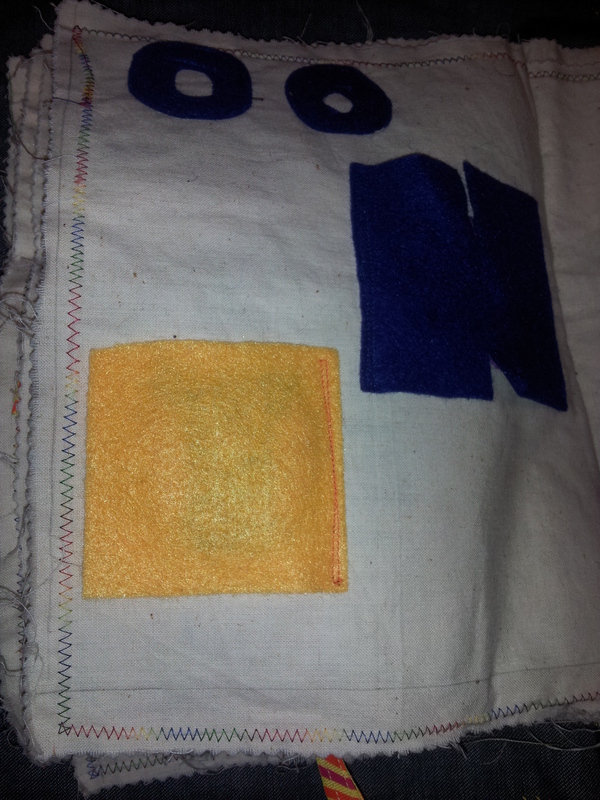 I also sewed along the sides of the apron top in order to neaten up the side seams. 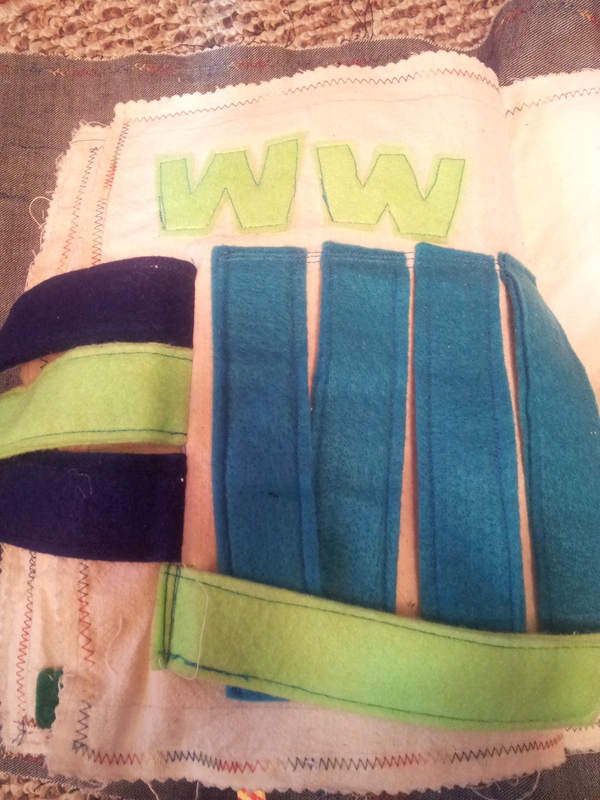 I then fit, pinned, and sewed a section of the sham onto the bottom of this strap, which became the bottom of the apron. Sorry, I don’t have any photos of this. Sunny has locs that are kind of long, so we thought it would be cool to braid her hair around a section of wire (cut from a hanger) so that her ponytails would stick out a little. 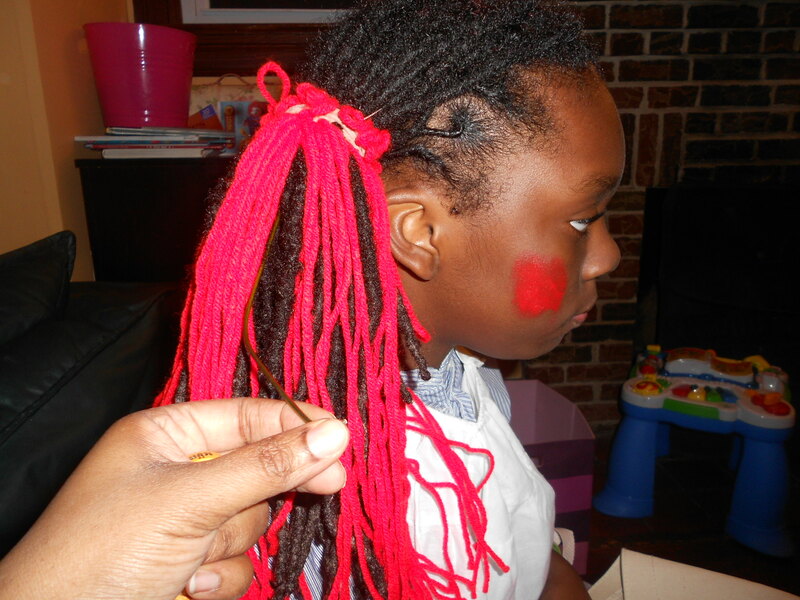 I also cut some bright red yarn and mixed it in with her hair for some color. Very cute, don’t ya think? 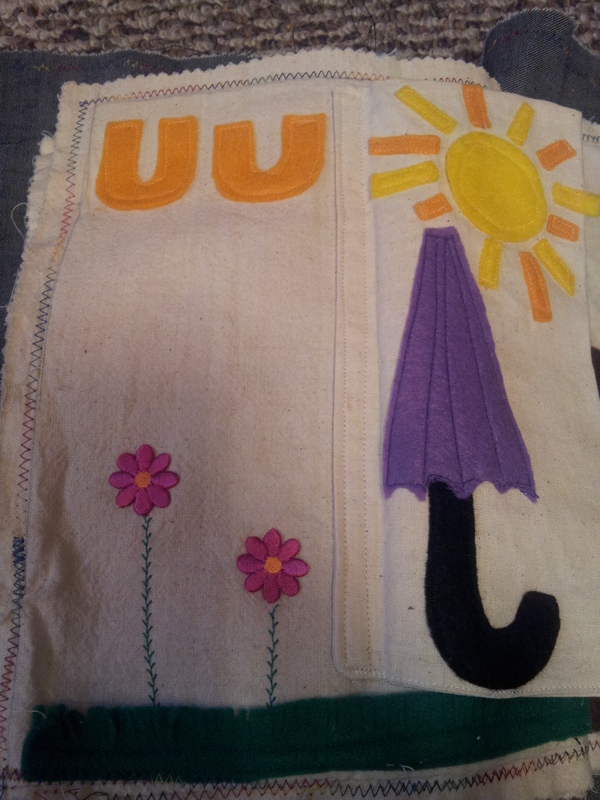 My ‘apron’ even came out looking a lot like an apron. So exciting. 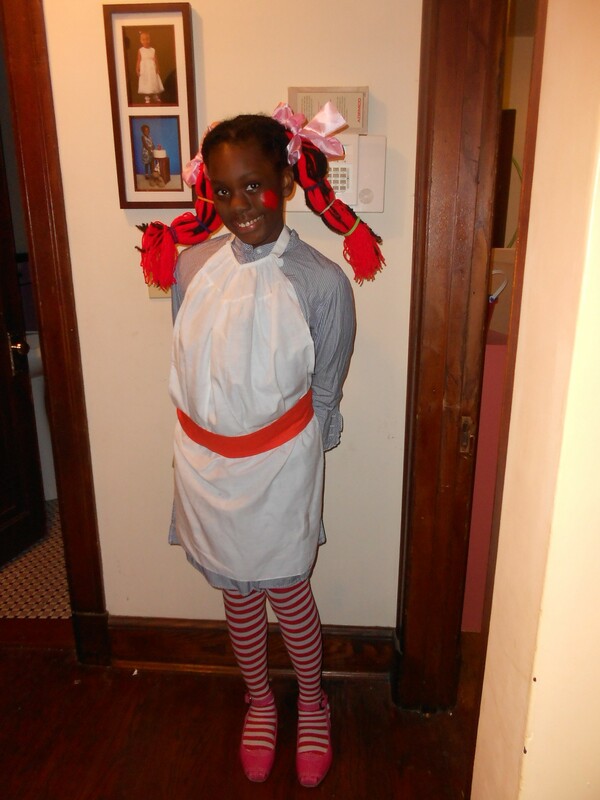 This entry was posted in Halloween, Sewing and tagged homemade halloween costume, Homemade ragdoll costume, sew apron for child's costume on November 16, 2011 by crunchysoul.